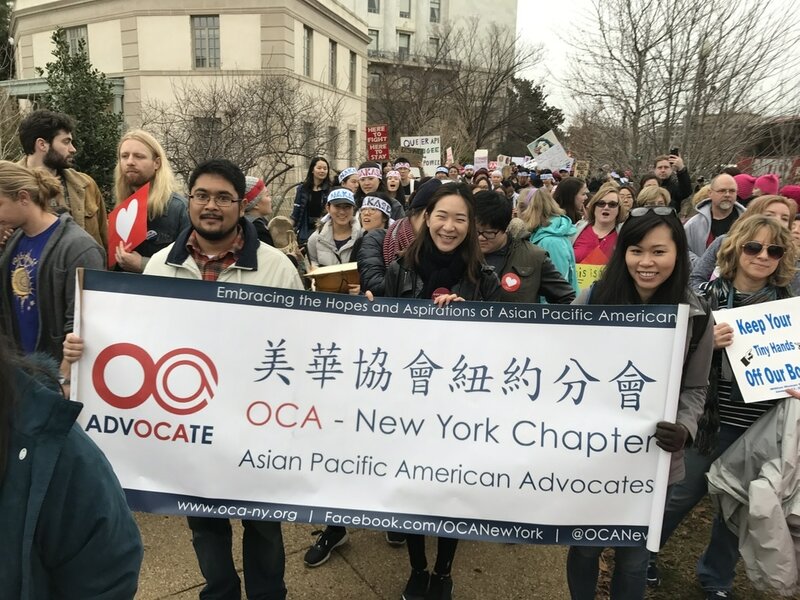 ​Founded in 1973, OCA Asian Pacific American Advocates is a national non-profit civil rights organization promoting and protecting the political, economic, and cultural rights of Asian Pacific Americans in America. We are interested in working with anyone who shares our mission of creating a stronger America by advocating for the values of equal liberty and justice for all. ​Support our programs. Donate now! OCA-NY is seeking a part-time Winter 2019 intern (January Start)! 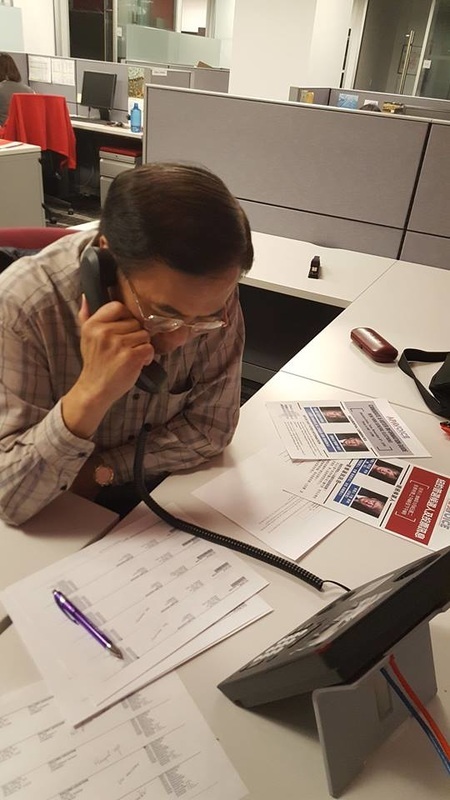 Washington, DC – OCA – Asian Pacific American Advocates is extremely alarmed at President Trump’s intent to end birthright citizenship. Yesterday, the President told “Axios on HBO” of his plans to end family immigration through an executive order that would terminate the right to citizenship to children of non-citizens born on U.S. soil. His plan challenges the 1898 case, United States v. Wong Kim Ark. The U.S. Supreme Court ruled 6-2 that Wong Kim Ark, who was born in San Francisco to Chinese parents who were permanent residents, was naturally a citizen of the United States and guaranteed the protections and birthrights of a U.S. citizen. The United States is one of thirty countries in the Western Hemisphere that guarantees birthright citizenship. We strongly condemn the President’s plan to terminate birthright citizenship. This is another example of his attempts to incite fear about immigrant communities and a clear example of executive overreach. Our communities see this plan and announcement for what it is: a political distraction. President Trump does not have the unilateral authority to rewrite the Constitution. Any statement to the contrary is false. What our country needs is unity and actual immigration reform that protects immigrant communities rather than ill-disguised political ploys attacking our families. Please join OCA-New York during our third annual B3 Leadership Summit "Career and Community: The More You Grow" with Comcast NBCUniversal next Wednesday, October 24th from 6-9pm (program will start around 7pm). We have a great line up of panelists and will be providing food and refreshments as well! See our flyer for more information (attached) or register now at https://www.ocanational.org/b3-nyc-2018 before October 19th! *Must register in advance to attend due to security guidelines at NBCU. 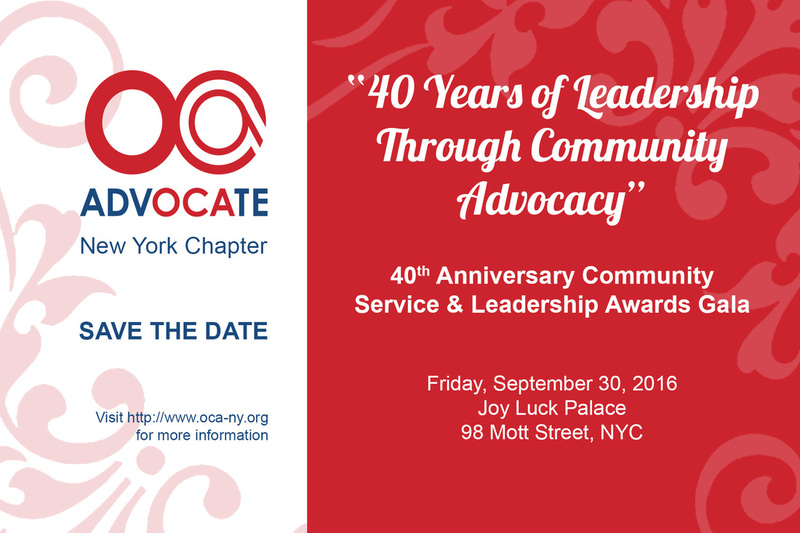 OCA-NY presents our 42nd Annual Community Service & Leadership Awards Gala! On behalf of the Board of OCA – Asian Pacific American (APA) Advocates, NY Chapter (OCA-NY), a non-partisan civil rights organization, we are pleased to invite you to our 42nd annual Anniversary Community Service & Leadership Awards Gala Benefit, to be held at the Royal Seafood restaurant, 103 Mott St, New York, New York, on Friday evening, September 28, 2018 at 6 pm. Price includes a provided lunch. ALL walk in registrations will be $50 per person. We will also need a number of full day volunteers- please email to let us know that you would be available. Registration would be free for full day volunteers. If you are a nonprofit or business that would like to table/participate in our vendor fair, or help sponsor our event, please also email us. OCA-NY is seeking a part-time Fall 2018 intern! ​OCA-NY is seeking a part-time Fall 2018 intern to provide organizational and project support to the Board of Directors of OCA-NY! Duration: The internship runs for at least 10 weeks during the Fall of 2018. Specific internship dates can be flexible and will be discussed in person. Application Deadline: Sept. 28th, 2018! OCA-NY is kicking-off a new round of voter registration drive to increase voting participation in advance of this year’s statewide elections. We will be mobilizing resources in Asian American communities to help eligible citizens to register to vote. The drive will include setting up registration tables around various communities, phone banking, and door knocking to help Americans register for the upcoming election. (New York) The Board of Directors of OCA-NY (‘The Chapter’) have officially launched the 2018 Scholarship Program today. The program is open to full-time undergraduate students, with a max of 4 winners, each of whom will receive $2,000. 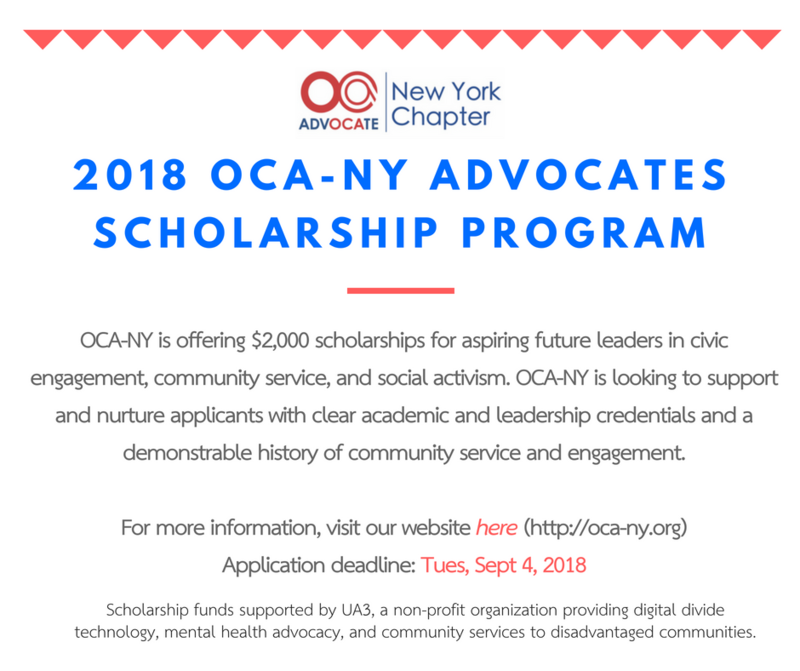 OCA-NY is offering the scholarship for aspiring future leaders in civic engagement, community service, and social activism. The Chapter is looking for applicants with clear academic and leadership credentials and a demonstratable history of community service and engagement. Applicants must be full-time students, have graduated from high school, and enrolled or admitted to an accredited college or university. The Scholarship Selection Committee of the Chapter will be responsible for selecting the winners. The deadline is September 4, 2018 (Tuesday). 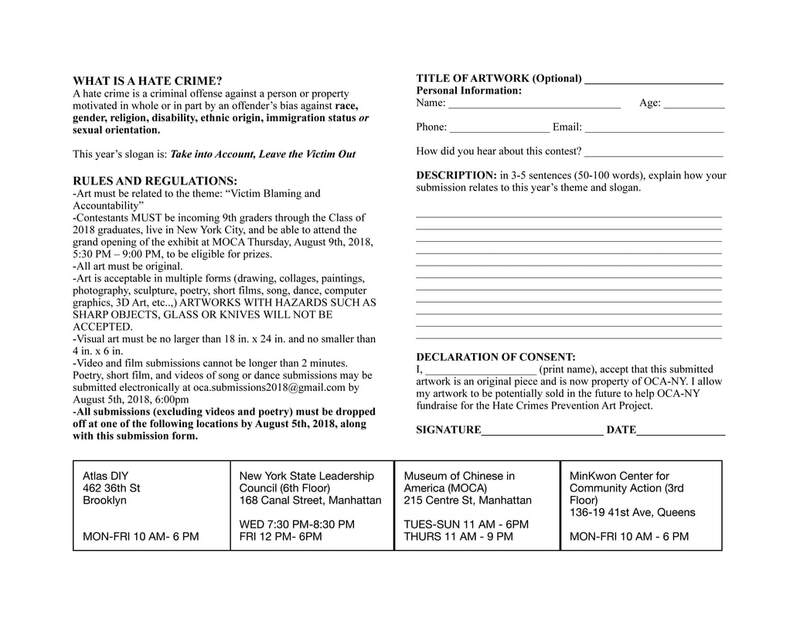 Detailed application conditions and application forms can be found on the Association's website at http://oca-ny.org. The Chapter will contact the winners by e-mail. The scholarship will be awarded at the Chapter’s 2018 Annual Gala on September 28, 2018. The winners or their representatives must attend to receive the award. Scholarship funds supported by UA3, a non-profit organization dedicated to crossing the digital divide in technology, providing mental health advocacy, and community services to disadvantaged communities. This Administration completely ignores the reality of race in America. The fact is that we do not live in a post-racial society. Race often informs where students live and go to school, and along with their opportunities for employment. 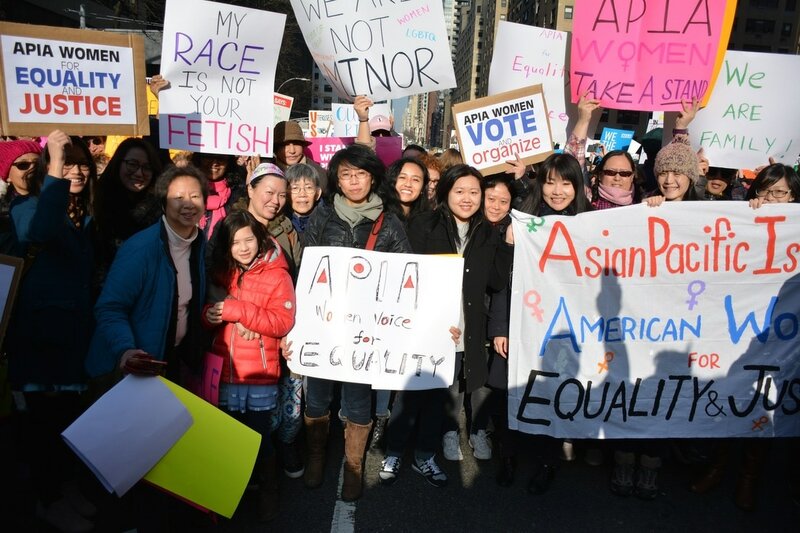 Affirmative action has historically helped Asian Americans and women access institutions of higher learning. Still, certain Asian American and Pacific Islander communities still face considerable educational barriers. For example, only 17 percent of Hmong and Cambodian Americans have a bachelor’s degree, along with only 8 percent of Samoan and 10 percent of Tongan Americans. Holistic admissions inclusive of race in higher education is critical to engendering equity and equality for students of color. Although non-binding, this reversal sends a clear political message that diversity and our communities’ lived racial experiences do not matter. Courts have ruled time and again the legality of affirmative action policies. The President must reverse this decision, uphold the law, and reaffirm our federal government’s obligation to diversity and access in our schools. Yesterday, our justice system upheld the Administration’s Travel Ban – a policy that is rooted in xenophobia rather than facts. Despite the context surrounding its intention, Justice Roberts and the majority opinion defended the ban on national security grounds. The United States has a history of disenfranchising and targeting communities without stating the obvious. Notably, Executive Order 9066 did not specify Japanese Americans, but it was applied to over 120,000 Japanese Americans on the grounds of national security. Indeed, it is extremely hypocritical of the majority opinion to utilize their decision to overturn Korematsu v. United States; exchanging one racist policy for another only harms our country. In light of the Court’s failure, we call on members of Congress to advance legislation prohibiting the implementation of the travel ban. ​New York, NY – OCA New York - Asian Pacific American Advocates, questions Mayor Bill de Blasio and NYC School Chancellor Richard Carranza’s proposed Bill A10427A which calls for changes to the current single-admissions test criteria to the city’s Specialized High Schools with the hope of improving fairness for all students seeking admissions and greater diversity at each of these Specialized High Schools. While we applaud the Mayor and the Chancellor for trying to make changes that diversifies the classrooms for all children, eliminating the single-test criteria in the near-term is a slap-in-the-face to the Asian American communities of this great city. Asian Americans make up nearly 16% of the public school population, many of whom are recent immigrants. They arrive in this city with hopes and dreams of educating their children so they can have a better life. Striving to gain admissions to an elite secondary school is the first-step in this process. The data establishes that Asian Americans constituted 52% of those admitted to the 8 Specialized High Schools. Furthermore, many of these Asian American kids come from low-income families and/or are recent immigrants where English is not their first language. Yet, these students work hard, focus, and work diligently to excel to gain admissions to one of these schools. In their announcement for these proposed changes, the Mayor and Chancellor displayed racial undertones and stereotyping of Asian Americans that were deplorable. What they have done is pit one community of color with another. The Asian American community deserves a public apology from both the Mayor and the Chancellor. 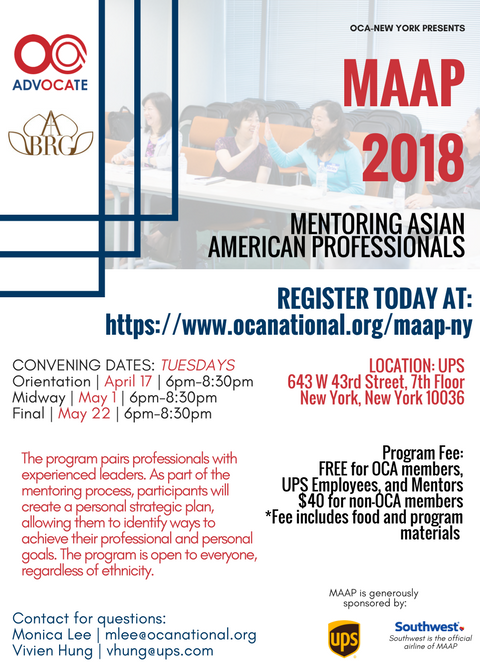 Moving forward, OCA-NY invites the Mayor and the Chancellor to a community meeting with Asian Americans to discuss possible approaches to enhancing admissions fairness and diversity. 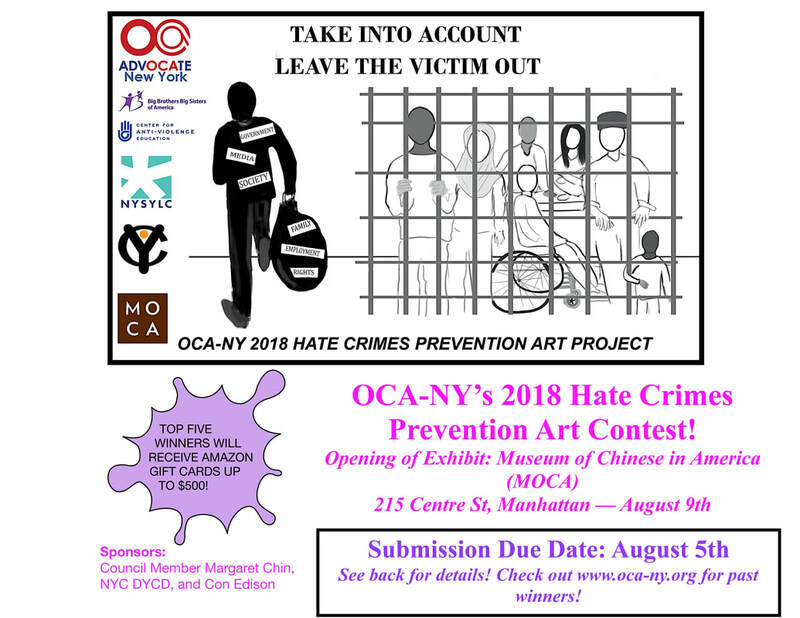 OCA-NY is looking for a college student or recent college graduate for a full-time summer internship position to coordinate OCA-NY's 12th Annual Hate Crimes Prevention Art Project. Xenophobic hatred is on the rise with the current political climate, fueled by racist and homophobic scapegoating by elected politicians and organized hate groups of marginalized communities-racial and ethnic minorities, immigrants, LGBT, and women. Now, more than ever, this Project is needed. This Project involves coordinating and training of diverse high school teenagers from select youth organizations on hate crimes and using art as a tool to prevent hate crimes. 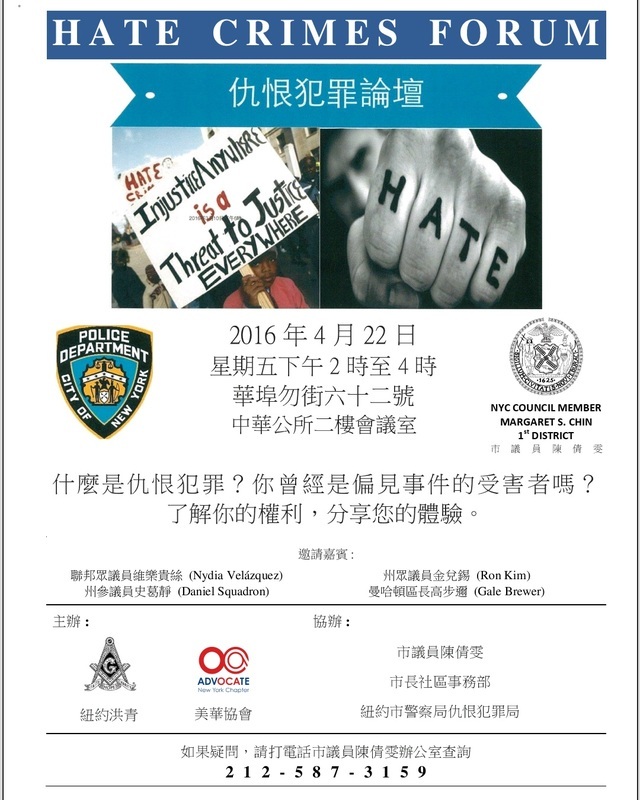 These youth will then devise the rules of a city-wide hate crimes art contest, advertise the contest, judge the submissions, and plan the opening of the Art Exhibit at the Museum of Chinese in America, which is the culmination of the Art Project. For more background about the history of the project, please go to www.oca-ny.org. Please send a cover letter, current resume and essay (500 words maximum) on why you should be selected for this position, include names and contact information of two references: one from someone who is knowledgeable about your character and leadership skills and one from a professor that has taught you within the last year. E-mail cover letter, resume, essay and references to info@oca-ny.org. 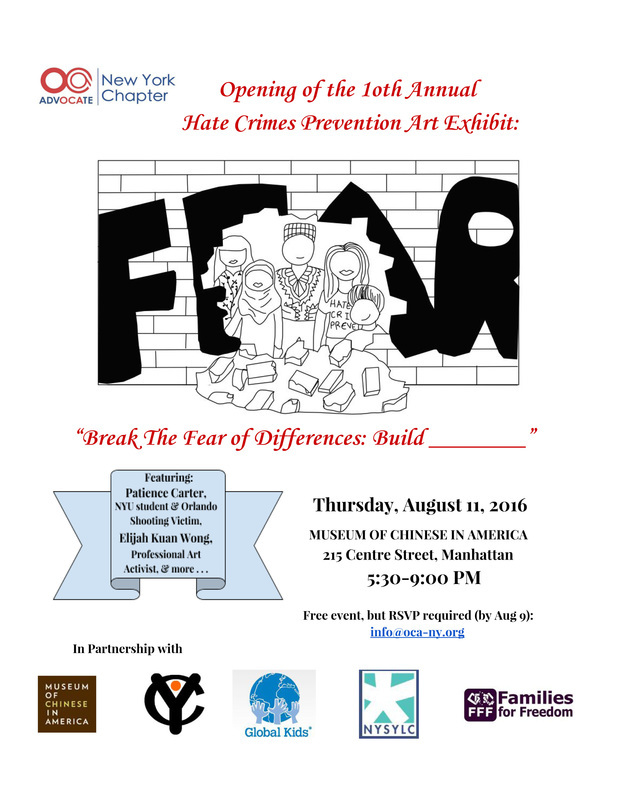 Indicate in the subject line: "OCA-NY Hate Crimes Project Summer Internship-then put your name." Please share with any person you see fit. Thank you for supporting our efforts to combat hate and division in the community. 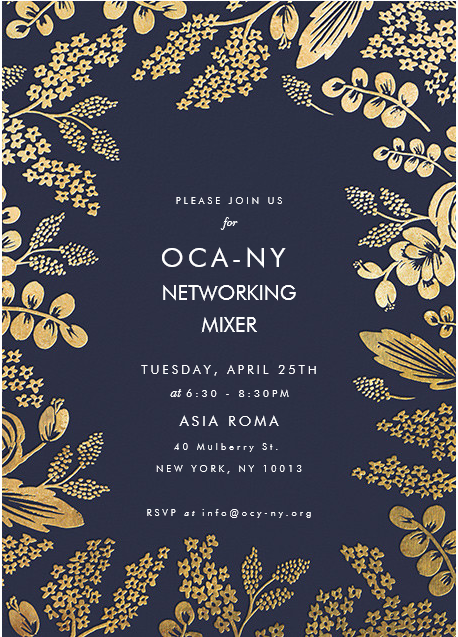 Join us at OCA-NY's Networking Mixer on 3/8 at Asia Roma, 40 Mulberry St (see attached)! Come learn about what OCA-NY's been up to with the Get Out the Vote efforts! We'll be signing up people for the Mentoring Asian American Professionals program. 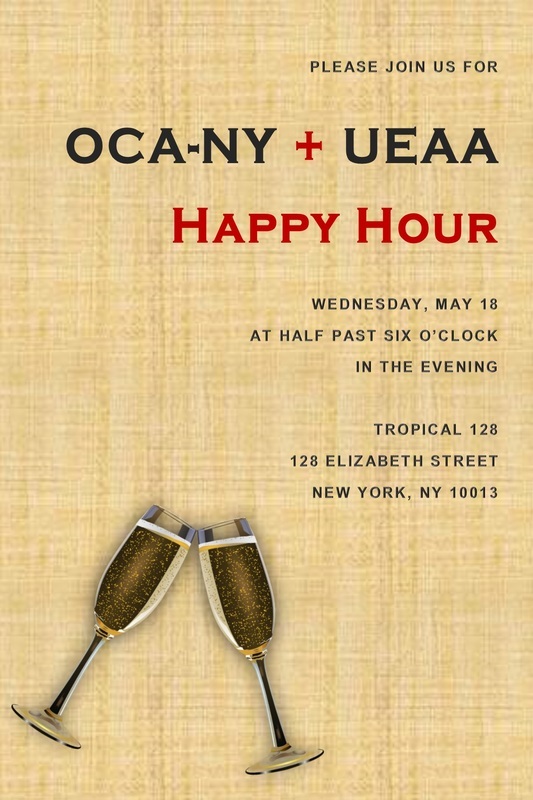 Meet and mingle with other OCA members and supporters over appetizers and drinks! Happy Lunar New Year! Gung Hay Fat Choy! -- From all of us at OCA-NY! We will be participating in two festive New Year Parades through downtown Flushing (Tomorrow, Sat., Feb. 17) and Chinatown (Sun., Feb. 25) Hope you are joining us! This year, the Lunar New Year Parade in Flushing will again feature vibrant costumes, floats, dancing and traditional Chinese celebrations. We will be joining the Greater Flushing Chamber of Commerce in the parade, meeting 10 a.m. at St. George’s Church and then march over to the parade site at Union Street and 37th Avenue. Meetup: P.S. 130 Hernando Desoto School (143 Baxter St, New York, NY 10013)Brace yourself for what's sure to be a wild celebration. The Lunar New Year Parade in Chinatown is stormed by dragons and dancers, while some of the best Chinese restaurants serve delicious food in celebration of the Lunar New Year. We will be joining the FCC Greater New York in the parade. Meetup at P.S. 130, family members, friends and PET DOGS are all welcome! We will be setting up some water bowls for the Dogs in the courtyard connected to the space we'll be in. There will also be a Pre-Parade Party for prep, dumplings, sweet snacks, fruit, refreshments AND Lion Dance performance! If you and your family would like to join us, please RSVP to OCA-NY Board Co-Treasurer Danny Qiao at dogqiao@gmail.com or 516-445-3208. Of course, no visit to Flushing or Chinatown is complete without food! After the parades, we invite you to join us for lunch/dim sum! This is a Call to Action Letter given that the DREAM Act and the immigration policy that defines us as a nation is at a critical juncture. We are asking you to call your members of Congress at 202-224-3121 to send a clear message: Pass the DREAM Act! And keep the Family Reunification Rights! I already called my congress members and urged them to continue to fight for a clean DREAM Act. Yesterday, House Minority Leader Nancy Pelosi held an 8-hour filibuster aimed at forcing the immigration vote while hundreds of Dreamers rallied in Washington D.C. for a DACA solution. OCA-NY stands with immigrants and advocates, and Dreamers in Washington, D.C. and across the country. We demand a clean DREAM Act now! ​THE 2017 DREAM ACT is a permanent, bipartisan and bicameral legislative solution for over 2.1 million immigrant youth and young adults who came to the U.S. as children, but have no pathway to citizenship. This includes the 800,000 Deferred Action for Childhood Arrival (DACA) recipients who are currently left in uncertainty and limbo after the termination of the DACA program on September 5, 2017. Americans have, by and large, affirmed the fundamental fairness of this test of valuing both family visas and high-skilled visas. The Gallup organization asked Americans in 2013 if they would prioritize high-skilled workers or people with family members already in the United States. It found that roughly equal proportions of Americans supported each priority. ​We invite you to join our community partner JACL NY Chapter for the inaugural celebration of Fred T. Korematsu Day of Civil Liberties and the Constitution in New York City! We look forward to seeing you Tuesday, January 30, as we hear from politicians, scholars, and activists to discuss this important milestone. The program will honor Fred Korematsu as a civil liberties role model, recognize the efforts of allies who worked on the campaign to make this important day a reality, and bring attention to Korematsu's legacy and its relevance to today's issues. Moderated by Rocky Chin, Esq. The Museum of Chinese in America and the National Immigration Forum are convening local business leaders to discuss the Forum’s innovative model for working with area employers to help their immigrant employees attain U.S. citizenship. This program, New American Workforce, offers information and application workshops as well as English and civics instruction in order to pass the naturalization test - all at the worksite. Having partnered with many local employers, including employees of several departments within New York City, New American Workforce is inviting other local businesses to join in partnership to help the roughly 1.5 million area legal permanent residents learn about the opportunities citizenship provides and move forward with applying. This roundtable will further underscore the employer and employee benefits of offering citizenship services at the workplace, as well as mobilize and encourage more business to join the program. 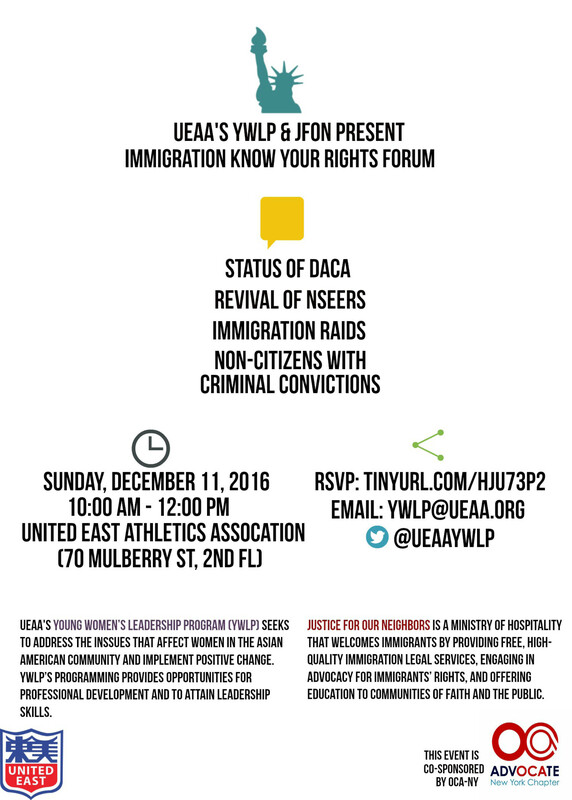 We are joining OCA National, New York Immigration Coalition, and other organizations national wide for a Mass Mobilization Efforts for Dreamers Dec. 6th. Please RSVP if you are able to participate. Chi Loek, President of OCA-NY will be attending. His number is 917-697-2842 if you need any information. This Administration is determined to ruin the lives of DREAMers and the tens of thousands of immigrants with Temporary Protected Status (TPS), by rescinding protections that have allowed them to build homes and futures in the United States. We can’t let this happen to our immigrant communities, which is why we need you in D.C.
Where/When: Rally at Upper Senate Park on Dec. 6th at 12:00 p.m. with at least 10,000 people. Civil disobedience to follow at 2:30 p.m. Echo events happening across the country. How to Participate: Attend the rally and encourage others to attend. RSVP for a seat on our bus, and demand Congress pass a DREAM Act Now and protect TPS on December 6th! Stand with us. #OurNY depends on it. The MLB punishes players for sins against baseball and sins against the greater society, and racism should not be exempt. The MLB must show that it will not tolerate discrimination, racism and slurs by both members of the MLBand baseball fans alike. OCA-NY is pleased to share with you that Governor Andrew M. Cuomo announces Excelsior Scholarship application reopens for students attending college this Spring. Governor Andrew M. Cuomo today announced that the Excelsior Scholarship application for students to attend SUNY or CUNY tuition free this spring semester will open today, Monday, October 30th and will be open until December 4th. Recipients of the Excelsior Scholarship's spring awards will join the more than 210,000 students already attending a public college or university in New York State tuition-free, and the 45,000 students deemed eligible for the Scholarship in the fall. Please share with your anyone who is able to take advantage of this opportunity. of New York City Council, ​establishing January 30 annually as Fred T. Korematsu Day (of Civil Liberties and the Constitution). We encourage you to participate the Commemoration of 6th Anniversary of Pvt. Danny Chen's Death Tuesday morning. 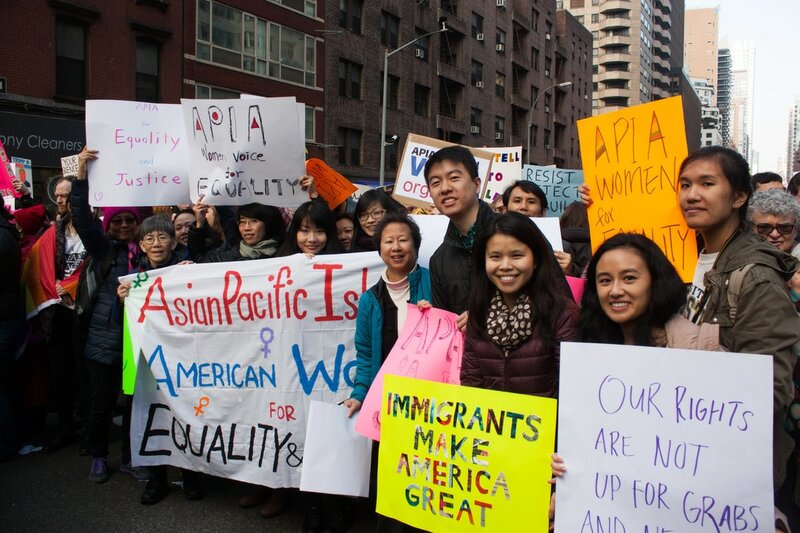 Next Thursday, the Asian American Federation is joining hands with our community partners and leading immigrant advocacy groups to hold an Asian. American. Dreamer. 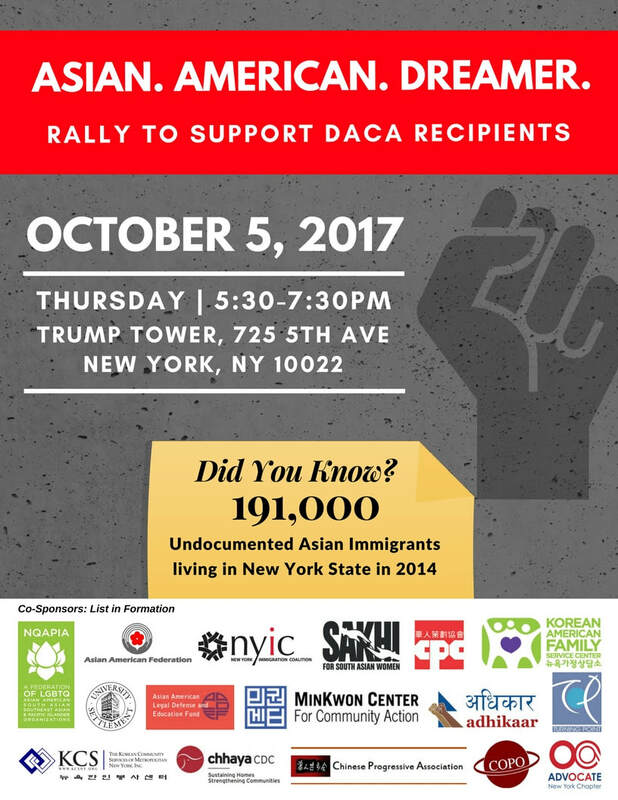 rally in support of Asian American DACA recipients who are being impacted by the dissolution of the DACA program under the Trump administration. OCA-NY is a co-sponsor of this rally and we hope you can come out to show solidarity. 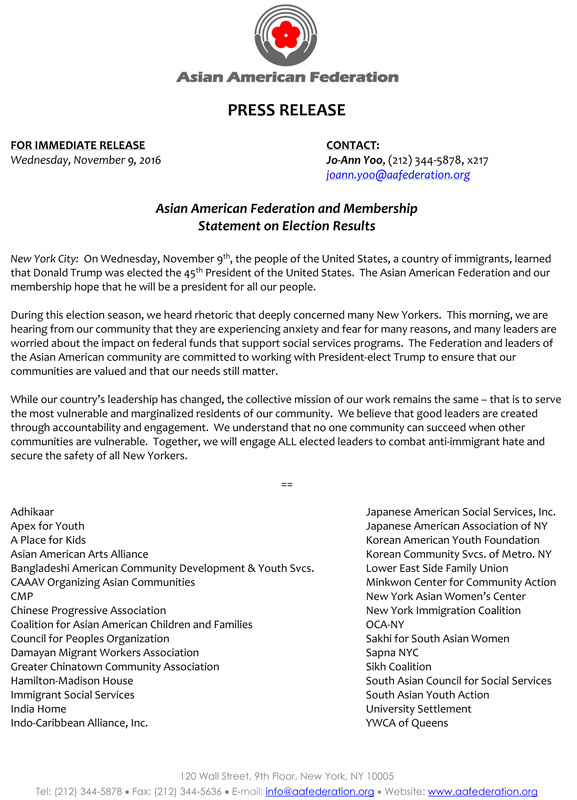 On the day that marks the deadline for the DACA status renewal, the Federation and our partners will rally to defend the future of DACA, a program that impacts over 270,000 Asian Americans nationally and over 191,000 Asian Americans in New York State alone. Organizers will mobilize the pan-Asian community and other immigrant communities to call on Congress to pass a clean DREAM Act, as well as other immigrant protection programs. Show up and lend your voice to recognize the importance of our Dreamers and immigrant communities and to protect their rights to live a full life outside the shadows. Attached please find the flyers. We hope to see you there! Join us Thursday, September 28 for the 2017 OCA-NY Gala! Our theme this year is “Celebrating Strength, Unity and Diversity.” We are proud to honor six outstanding individuals and an organization that have demonstrated sustained service in advocating and supporting the Asian American Pacific Islander (AAPI) community here in New York City, and more broadly, across our country. The Honorable Justice Dorothy Chin-Brandt, first Asian-American elected public official in the State of New York and the first Asian-American woman judge, will be honored with the OCA-NY Lifetime Achievement Award. 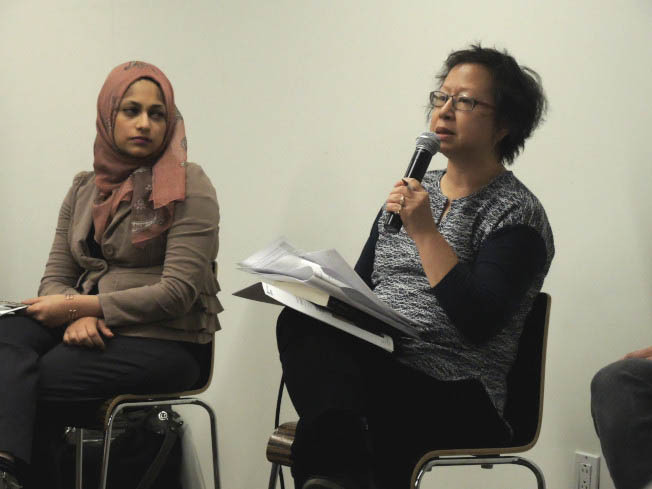 Dr. Helen Zia, is an award-winning journalist and scholar who has covered Asian American communities and social and political movements for decades, will be honored with the OCA-NY Lifetime Achievement Award. Steven Choi, Esq., is the Executive Director of the New York Immigration Coalition, an umbrella advocacy and policy coalition of nearly 200 member groups representing New York State’s immigrant communities, will be honored with the OCA-NY Leadership Award. Mrs. Lily Din Woo will be honored with the OCA-NY Leadership Award. During Mrs. Woo’s tenure as Principal of P.S. 130 Hernando de Soto in New York City’s Chinatown for 25 years, she instilled confidence and created a positive learning environment to students, where 82% were on free and reduced lunch program and risen their performance to the 98th percentile. Mrs. June Jee will be honored with the OCA-NY Leadership Award. She is the immediate past President of OCA-NY and is the current OCA National Vice President of Education and Culture. June is a community activist who strives to build communities through coalitions and partnerships. 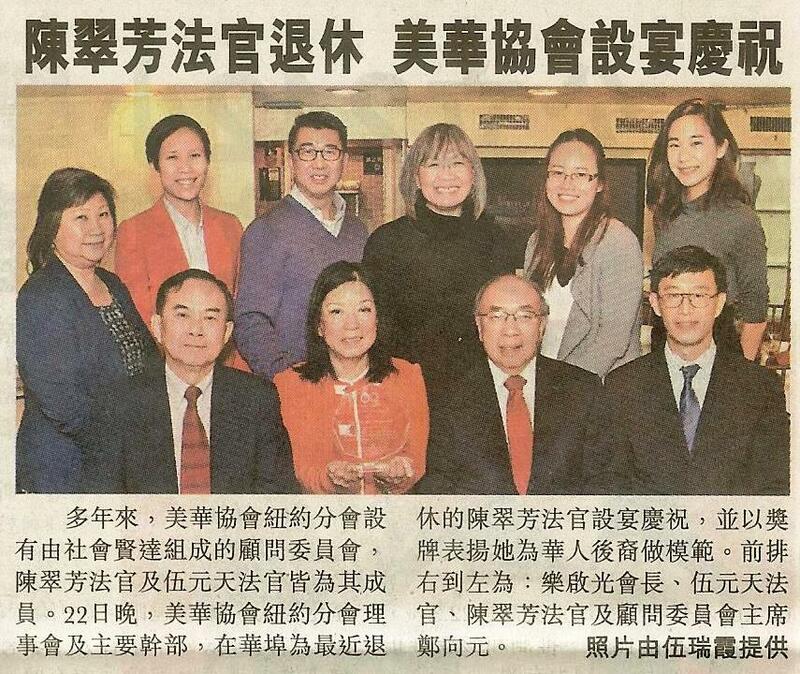 ​First American International Bank (FAIB) will be honored with the OCA-NY Community Service Award. ​Found in 1999 with the dream of bringing meaningful banking services and financial guidance tothe Chinese American immigrant community, FAIB is the largest locally-owned Chinese American community bank in New York, with offices in Brooklyn, Queens and Chinatown (Manhattan), offering afull array of consumer and business banking products and services. Major Sponsors - Thank You! Don’t forget to get out and vote on Tuesday, September 12, 2017 in the local primary elections! All polling locations will be open from 6 AM – 9 PM. New York City is holding regular elections for mayor, comptroller, public advocate, and all 51 seats on the city council this year. Partisan primaries are scheduled for September 12, 2017 and the general election will be held on November 7, 2017. If you have any questions, please contact the NYC Board of Elections hotline at 1-866-868-3691. Remember, we can all make a difference by exercising our vote! The nation’s DREAMers are under attack. Moments ago, the administration announced that it will end Deferred Action for Childhood Arrivals (DACA) - a program that has provided work authorization, protection from deportation, and a new lease on life to immigrant youth brought to the US as children. The consequences of ending DACA will be dire for more than 800,000 DREAMers across the country - and 50,000 here in New York. We CANNOT stand by as this administration demonizes immigrant youth and tears families apart. Join our 5PM rally at Foley Square TODAY. We are taking to the streets to remind the President and AG Jeff Sessions that we won’t stop protecting immigrant New York - that we are HERE TO STAY. More info here - please share! Past OCA-NY President June Jee will be present. OCA-NY is co-sponsoring the City Council District 20 Candidate forum on Sunday, August 20 as an APA VOICE member organization. 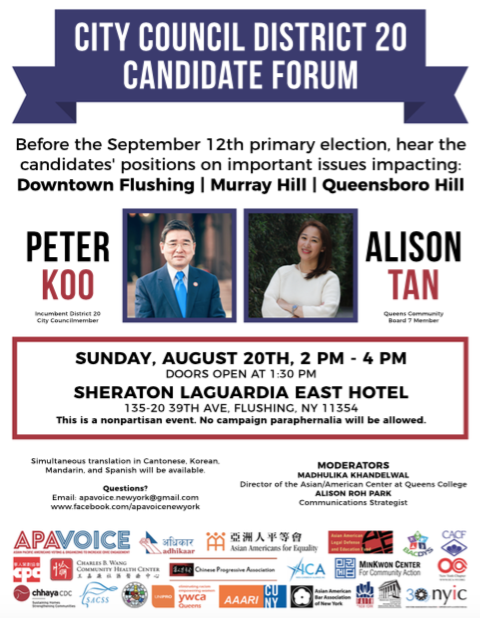 We would like to invite you to participate and hear the candidates' positions on important issues impacting Downtown Flushing, Murray Hill, Queensboro Hill areas of Queens. Primary election is September 12. This is a nonpartisan event. No campaign paraphernalia will be allowed. Simultaneous translation in Cantonese, Korean, Mandarin, and Spanish will be available. OCA-NY invites you to cheer on our very own dragon boat team during the 27th annual Hong Kong Dragon Boat Festival in New York on Saturday August 12th. We will be hosting an all-day BBQ sponsored by UA3. OCA-NY Dragons is the community-based dragon boat team of OCA-NY, the New York Chapter of OCA Asian Pacific American Advocates. 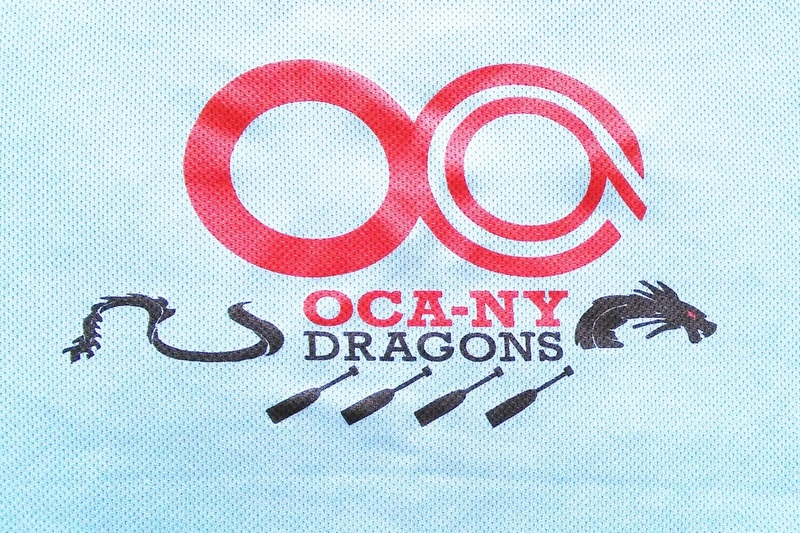 In full embodiment of our mission, OCA-NY Dragons welcomes paddlers of all levels and creeds. This year, we have over 20 Dragons on the team, ranging from first timers to veterans, students and young professionals to community leaders and volunteers. 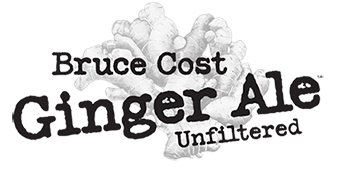 Special Thanks to Bruce Cost Ginger Ale Unfiltered for sponsoring OCA-NY Dragons with drinks for all of our practice sessions. 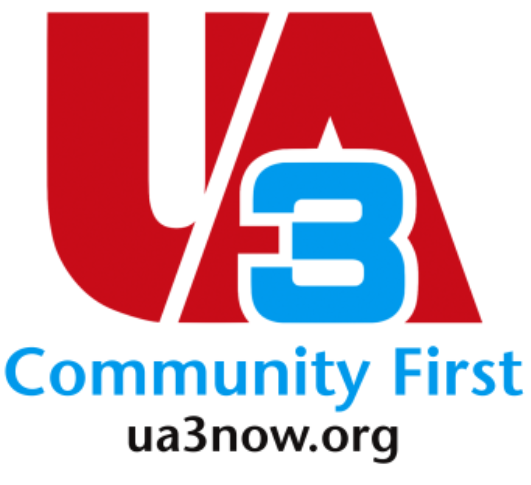 Special Thanks to UA3 for sponsoring the BBQ during the festival. OCA-NY Asian Pacific American Advocates is honored to once again co-presents the Asian American International Film Festival (AAIFF) in New York City. We would like to share with you a New York State initiative that supports New Yorkers through the naturalization process by providing application and financial assistance. Please forward to your friends and family members who are in the process of becoming a U.S. Citizen. Created by the Governor's office and administered by the New York State Office for New Americans, NaturalizeNY is an initiative that supports immigrant New Yorkers through the naturalization process by providing free eligibility screenings, application assistance, and exam preparation. Enter the lottery before July 28th and save on the cost of the federal application fee. ​Registration and more detailed information can be found here. NaturalizeNY is administered by the New York State Office for New Americans in partnership with the Robin Hood Foundation, New York Community Trust, universities including Stanford University, George Mason University, and SUNY Albany, and media organizations. Resist, Recycle, Regenerate 反对－回收－再生 is a series of workshops for Asian American girls that teaches papermaking and printmaking using discarded Chinese New Year fireworks recycled as hand-printed zines. In collaboration with MOCA and the School of Authentic Journalism the girls will conduct oral histories, map their family histories and learn about immigration laws that have shaped Chinatown’s past and how they can intervene in its future as young artists and activists. RESCHEDULED FOR JUNE 15th, 5:30 pm. Join your State Legislators and elected officials for a discussion on voting reform for new Americans. Open to the public, this Town Hall held at the Queens Library will include a community education presentation and a Q&A session with your local state legislators. 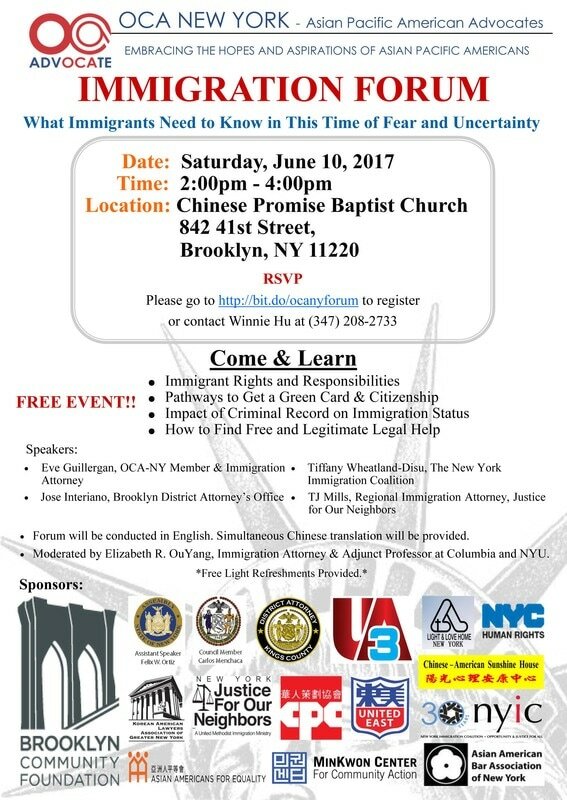 This event is sponsored and made possible by the The New York Immigration Coalition Civic Engagement Collaborative. 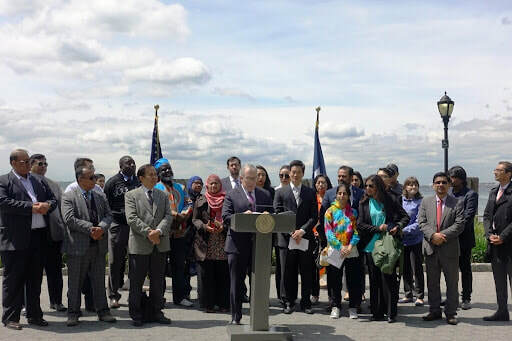 In the morning of May 12, New York City Comptroller Scott M. Stringer held a Press Conference at the Battery Park in the Lower Manhattan. He called for the creation of a public-private New York City Citizenship Fund to help tens of thousands of legal immigrants cover the ever-rising costs of the federal application to become a U.S. citizen. New York State State Senator Daniel Squadron and Assembly Member Yuh-Line Niou were present. 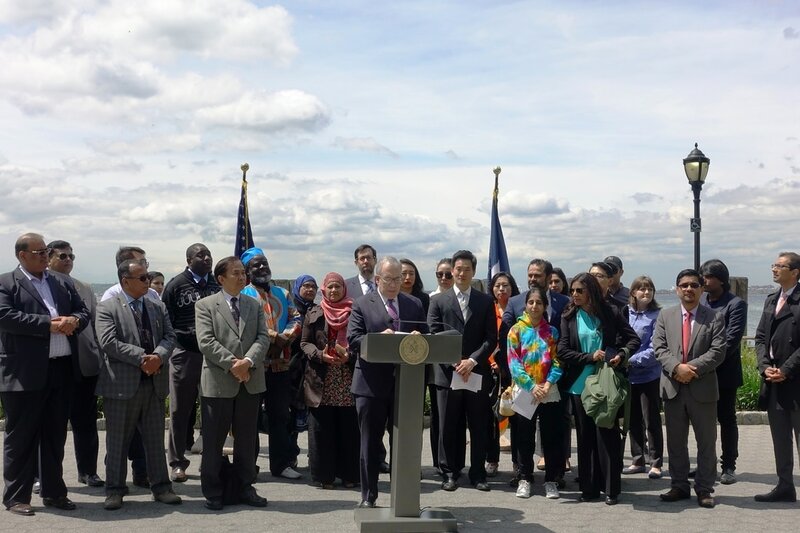 Among the many immigrant representatives, OCA-NY, AAFE and MinKwon Center for Community Action were there to support this important initiative. No one, including immigrants, should be subjected to such hateful attacks on any American street. Let us not forget, this nation is entirely a nation of immigrants. Unless you are Native American or can trace your history to pre-colonial times, your ancestors came to this country for the same reason millions continue to do so today: to enjoy democratic values, freedom to be different, and a better life for themselves and their children. Furthermore, let us not forget the positive impact immigrants, people who are not all that different from you and me, have made to our country when they reach our shores. In New York City, nearly 40% of the population is made up of immigrants. Immigrants have enriched every aspect of our multiracial society. OCA-NY has been fighting against race-based, ethnic-based, and immigrant-based hatred for decades. We will not tolerate any attempt by cowards to tear at our communities with racist and ignorant behavior used against anyone. OCA-NY is calling for a thorough investigation of this incident and continued policing of hate-based incidents throughout Greater New York City. Perpetrators of hate crimes should be prosecuted to the fullest extent of the law. We will continue to monitor and take community action against these acts of hate that threaten to divide our diverse and pluralistic society. WASHINGTON, D.C. - OCA - Asian Pacific American Advocates demands answers regarding the violent removal of a United passenger. On Sunday, April 9, prior to the departure of United Airlines flight 3411 from Chicago to Louisville, a passenger was violently removed from the aircraft as a result of the airline overbooking the flight and not having enough room for other crewmembers. Chicago Department of Aviation security officers pulled the victim, David Dao, who identified himself as Asian and a doctor, out of his seat and dragged him down the aisle to the exit. Dao then attempted to return to the aircraft with his face bruised and bloody, visibly shaken, andrepeating "just kill me" and "I have to go home." United Airlines CEO Oscar Munoz only offered an apology for having to "re-accomodate these customers," with no mention of the violence involved in the removal. In a separate email on Monday night, Munoz was dismissive about the passenger and stood behind the policies and procedures of the airline. "We were deeply disturbed by the videos of the United Airlines passenger, who was a victim of the company's poor booking policies, being violently dragged from the airplane. This episode reflects very poorly on our country and demonstrates a lack of judgment responsible of several parties. In responding to this incident, United should be conducting a thorough and objective investigation, addressing the incident directly, and apologizing for the vicious way it was handled. The Chicago Department of Aviation should also be held accountable for why their officers felt it necessary to use violence to remove the passenger," says Ken Lee, OCA Chief Executive Officer. "Indeed, the optics of a bloodied elderly Asian man being forcibly removed from his seat is something we cannot ignore. Regardless of race or background, all individuals' rights and freedoms must be protected within the system. This incident is a clear example of authorities using excessive force. We demand answers from United Airlines and the Chicago Department of Aviation. 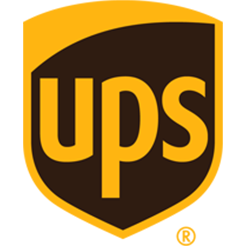 We look forward to hearing from the various governmental agencies in regard to this incident." 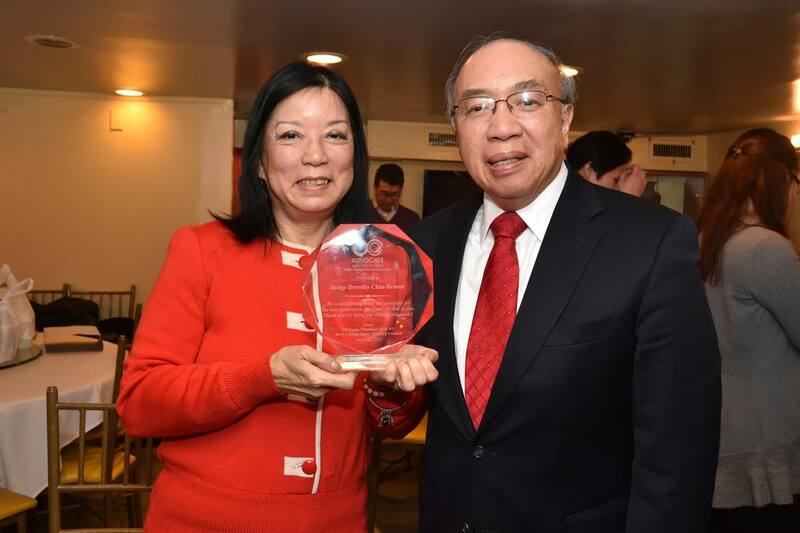 On March 22, OCA-NY had the greatest honor and pleasure to celebrate the retirement of Justice Dorothy Chin-Brandt's highly distinguished career of 30 years in public service as Acting Justice of New York State Supreme Court, Queens County. In 1987, The Honorable Chin- Brandt made history becoming the first Asian-American public official to be elected in the State of New York as the Judge of New York City Civil Court, New York County. Justice Randall T. Eng, the Presiding Justice of the Appellate Division of the Supreme Court for the Second Judicial Department also joined us at our Advisory Council/Board meeting. Justice Eng is the first Asian-American to serve as a Presiding Justice in New York State's history. We cherished the time Justice Chin-Brandt and Justice Eng spent with us in sharing their life experiences at our Advisory Council/Board meeting. 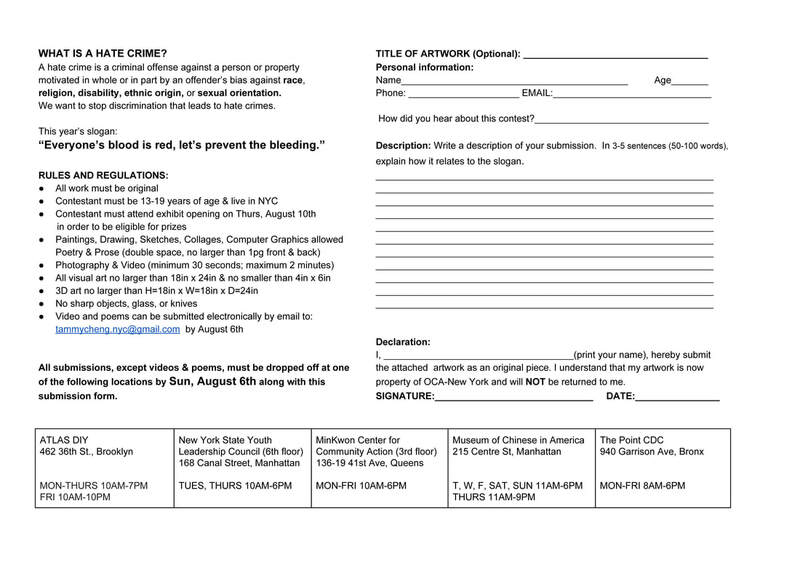 OCA-NY is looking for a college student or recent college graduate for a full-time summer internship position to coordinate OCA-NY's 11th Annual Hate Crimes Prevention Art Project. While 2017 marks the 35th Anniversary of Vincent Chin's death, the same xenophobic hatred is reemerging in today's divisive political climate. Now, more than ever, this Project is needed. This Project involves coordinating and training of diverse high school teenagers from select youth organizations on hate crimes and using art as a tool to prevent hate crimes. These youth will then devise the rules of a city-wide hate crimes art contest, advertise the contest, judge the submissions, and plan the opening of the Art Exhibit, which is the culmination of the Art Project. For more background about the history of the project, please go to www.oca-ny.org. THE RIGHT T0 VOTE is one of the most cherished rights of citizenship in the United States and the basis of our democratic form of government. OCA-NY supports more opportunities for citizens to be able to vote. Therefore join OCA-NY, APA VOICE, elected officials and our partners to support the Rally to Resist Voter Suppression. WHAT: ​We’re taking action to demand Governor Cuomo make New York a leader in election reform, not an example of voter suppression. This year's state budget must include essential voter reforms – early voting and automatic voter registration. CO-SPONSORS: Common Cause/NY, SEIU 32BJ, New York Immigration Coalition, Make the Road NY, Citizen Action, TWU 100, The Brennan Center, Brooklyn NAACP, 2 Hours A Week, New York Working Families, e:*1, Public Citizen, The New York Civic Engagement Table, Women’s City Club of New York, the New York Civic Engagement Table, NYC Votes, Get Organized BK, Daily Kos, The Carey Institute, DuBois Bunche Center For Public Policy, Hugh L. Carey Institute, NYPIRG, Citizens Union. ASKS: We reject the false assertion that voter fraud is widespread. The real problem with America’s elections is extensive voter suppression. New Yorkers believe that voting is the lifeblood of democracy and demand that Governor Cuomo include essential voter reforms – early voting and automatic voter registration – in the state budget that will be adopted by April 1st. Working class people, women, immigrants and people of color are disproportionally affected by New York’s arcane voting laws, if we update our electoral system more voices will be heard and we will have a more representative State. Meeting Place/Time: Battery Park at 1:30 p.m. Look for the OCA-NY Banner. Please RSVP. We look forward to hearing from everyone. Thanks and stay warm! 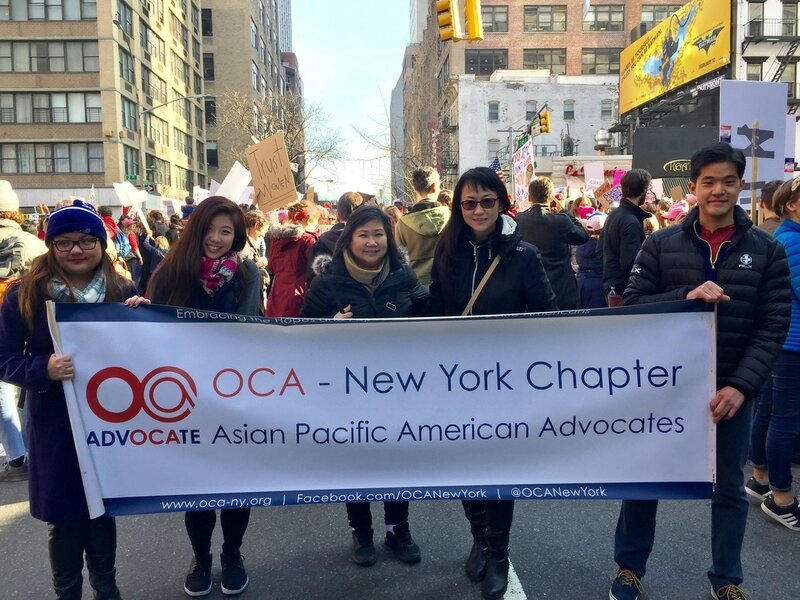 Now in its 41th year of existence as a volunteer-run membership organization, OCA-NY is seeking a part-time Program Manager to provide organizational and human resources consulting services to support the Executive Committee of OCA-NY in maintaining and enhancing its visibility and active presence in the broader New York City immigrant rights and voting rights advocacy community. Interface with the Board of Directors. Recruit and mentor new members, volunteers, and interns. Provide oversight and leadership in grants administration and applications, program/special events planning and development, administrative support (e.g., updating donor cultivation database and list serves), and overall development initiatives. Make civil rights a key priority. Develop and present a strong, substantive policy message to the community, funders, government officials, and the general membership. Maintain organizational website and work with the Board to enhance and maintain our presence on social media (especially Facebook). Required Integrity/Ethics: Demonstrated consistency in upholding and promoting the values of OCA-NY in actions and decisions, and in accordance with best practices in the non-profit industry. Additional Skills Preferred, but Not Required: Fluency in a Chinese dialect, and knowledge of New York City politics. We appreciate working with our partner organizations: Asian American Journalists Association ( Lead), Advancing Justice- Los Angeles, National Council of Asian Pacific Americans, Museum of Chinese in America, OCA-National, Reappropriate and Assemblyman Ron Kim on pursuing an apology and response from FOX for a racially offensive episode to the Asian community. We appreciate working with our partner organizations: Asian American Journalists Association ( Lead), Honorable Assemblyman Ron Kim, Advancing Justice- Los Angeles, National Council of Asian Pacific Americans, Museum of Chinese Americans, OCA-National and Reappropriate for working tireless to overcome this offensive episode. When criticism poured in after “Watters World” aired its Chinatown segment on Fox’s “The O’Reilly Factor” last October, Jesse Watters was taken aback. "I was surprised, at the time, with the blowback. I didn't see it coming, and that's on me,” said Watters, a correspondent at Fox. That’s according to a Dec. 30 article in Business Insider, in which Watters apologized for offending anyone with his Oct. 3 segment. The segment itself was billed as a report on Chinese Americans’ views on the U.S. presidential election but which AAJA and a slew of AAPI groups blasted for being rife with racist stereotypes. AAJA MediaWatch demanded an apology from Fox News to the AAPI community immediately after the segment aired. It also requested a meeting with the show’s producers to understand how the segment was conceived and greenlit to air, and further sought an explanation for how such coverage would be prevented in the future. After outreach from AAJA and the community, Fox News did in fact meet a number of those requests. On Oct. 25, a Fox News executive and an “O’Reilly Factor” executive producer met privately with AAJA and several national and local community leaders—including a member of the New York State Assembly, Asian Americans Advancing Justice, the National Council of Asian Pacific Americans, OCA, OCA-NY and Reappropriate—at the Museum of Chinese in America in New York. 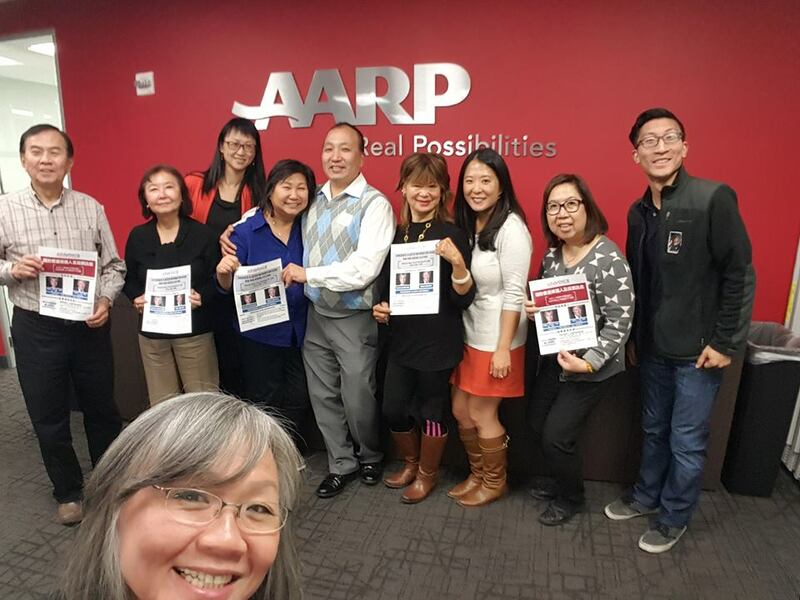 There, the executives were presented with an open community letter signed by 134 national, state and local AAPI organizations and allies, which requested that Fox News take several actions to address the community’s concerns, including issuing a public apology and instituting employee sensitivity training. Organizers based those demands from input that came out of a town hall meeting held on Oct. 9 in New York’s Chinatown. Fox was invited to the town hall but did not attend. Although Watters himself never met with AAJA or AAPI leaders, Tabacoff noted that his comments in the Business Insider article summed up his position on the controversy. “I understand I did offend a lot of people, and I'm very sorry for that,” Watters said in the article. “People took issue with some of the statements I made, and some of the reaction to the Chinatown segment, and I understand that. And it's a learning experience—I definitely learned a lot from it. But it's a new day, and we are moving forward with it." Tabacoff echoed that sentiment in his email to Cheung. 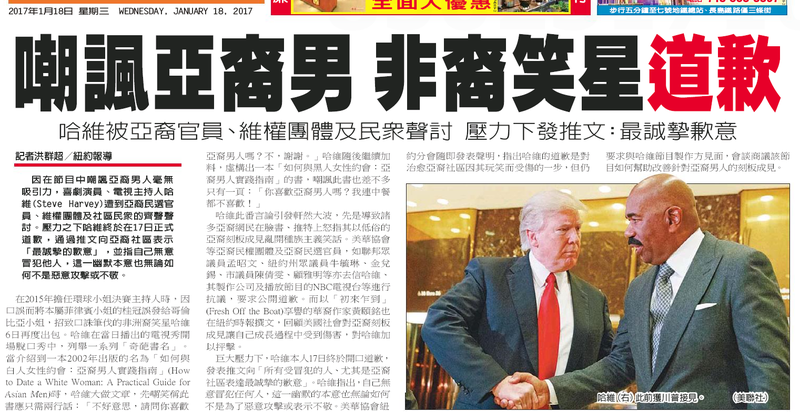 “We hope to move beyond this particular issue and maintain a positive relationship with the AAJA and your community,” he wrote. We want to share with you this important announcement from Speaker Melissa Mark-Vevirito. 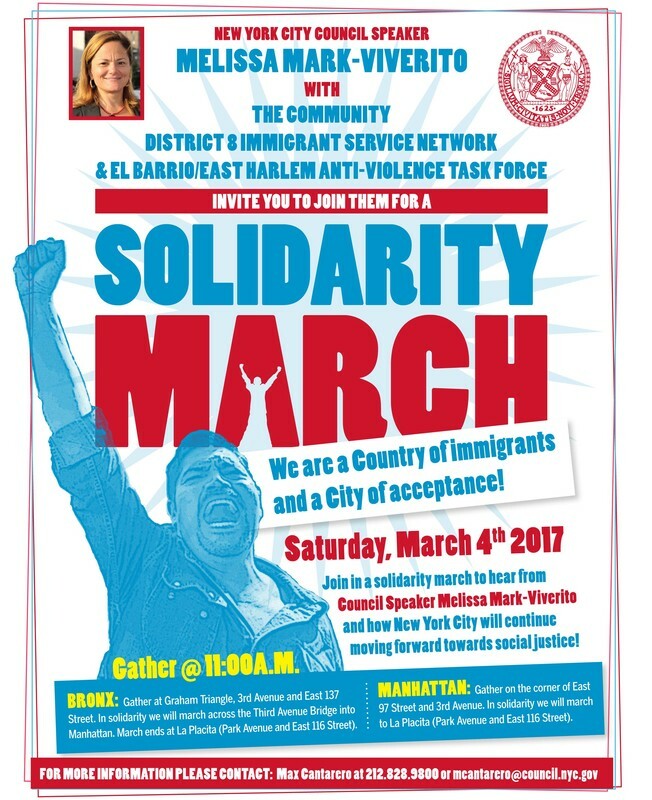 Speaker Melissa Mark-Vevirito would like to invite you and your friends to join her for a Solidarity March and show how New York City will continue moving forward towards social justice on Saturday, 3/4/2017. Attached please find the flyer for more details. Bronx Gathering: @ 11AM: Gather at Graham Triangle (East 137th St and 3rd Ave in Bronx). In solidarity we will march across the Third Ave Bridge into Manhattan. March ends at La Placita (Park Ave and East 116th Street in Manhattan). General admission tickets for the free program is first come first served. Maximum number of tickets reserved online is 2 per person. Registration does not guarantee space, so early arrival is encouraged. To be seated together, we will meet in front of the theater starting 1:30pm. Doors open at 2:00pm. So we may know how many people to expect, please rsvp to info@oca-ny.org as well. Print out your email confirmation and bring it with you the day of the event. 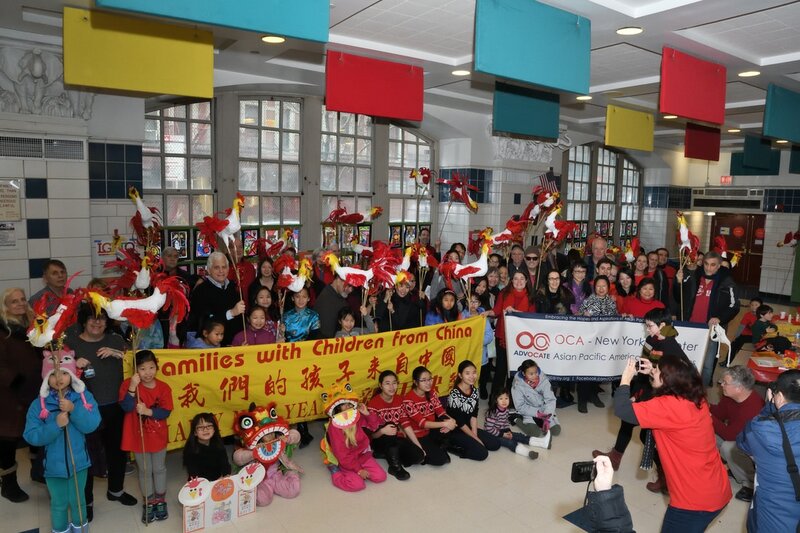 Thank you for participating in OCA-NY's 2017 Lunar New Year Event in Chinatown! 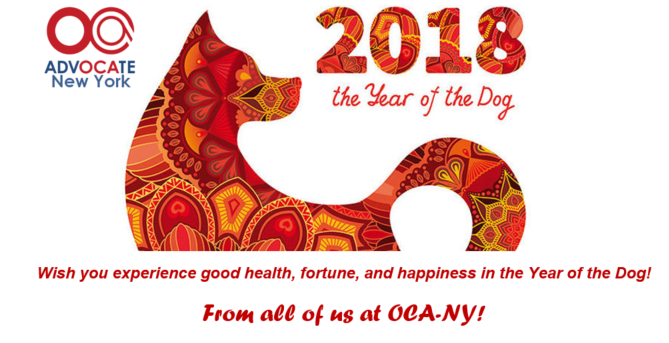 Please join OCA-NY in celebrating the Lunar New Year of the Rooster! Participate in the famous Lunar New Year Parade of Flushing, Queens -- the most diverse community in New York City! Meet at the Greater Flushing Chamber of Commerce office (39-01 Main Street, Suite 511) between 10:00AM and 11:00AM for hot coffee and donuts. We will then head off to the parade site, and pass out candies to children attendees of the parade. The parade should last approximately an hour. Please be sure to dress warmly, in layers. We encourage attendees to bring festive signs and banners. Afterwards, enjoy dim sum with us. Participate in the Chinatown Lunar New Year Parade Coordinated with FCC ( Families with Children from China). Refreshments will be provided. Meeting time is 11AM inside PS 130 at 143 Baster Street, NYC. Please join OCA-NY, NYIC and other community organizations in voicing our concerns on the recent Executive Orders passed by President Donald J. Trump, banning refugees and effectively banning Muslim immigrants of certain countries from entering the United States. Meeting Place/Time: 2:00 p.m. at Irish Hunger Memorial (North End Avenue and Vesey Street) in Battery Park City. Look for the OCA-NY Banner. ​Recently, Steve Harvey made racist comments about Asian Men. The following is our response. OCA-NY proudly supports the Women's March to be held in New York City on Saturday, January 21st, 2017. OCA-NY will march among those in the Women’s March in continuing our support for women’s rights, and the message about the importance of equal rights for all those who make up the fabric of our society, including immigrants of all statuses, religions of all faiths, the LBGTQ community, native people, and all minority groups. 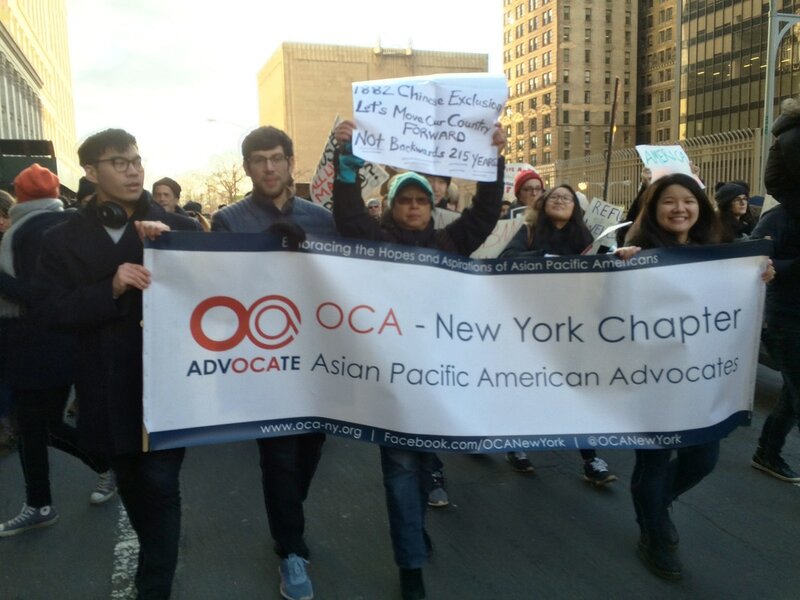 In marching in this event, members of OCA-NY would like to emphasize to the new administration the importance of bringing the country together, and to also quell the fears, concerns, and feelings of uncertainty,for those who viewed themselves as being most vulnerable under this new administration. 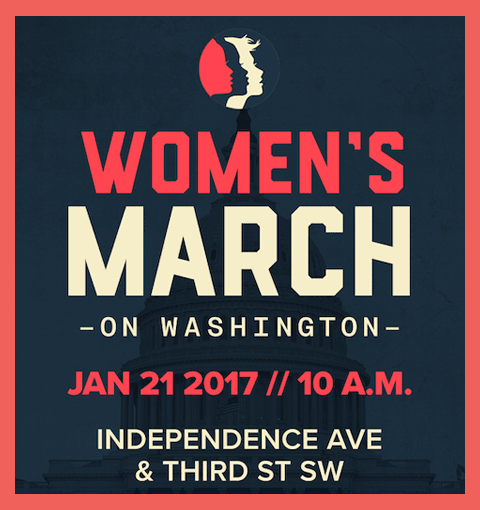 TheWomen’s March in New York City will be held in conjunction with the Women's March in Washington D.C., also occurring on the same day. Please join us in marching for this worthy cause. We will be meeting 12:00 noon at 1 Dag Hammarskjold Plaza, near 47th Street and 2nd Ave. Please look for the OCA-NY Banner. This year, we are pleased to have Michael Luo, Investigations Editor at the New Yorker and formerly with the New York Times join us for a discussion on his recent encounter with racism. The discussion will be hosted by Cary Chow, host and anchor at ESPN. Please RSVP by Friday, December 16, 2016. 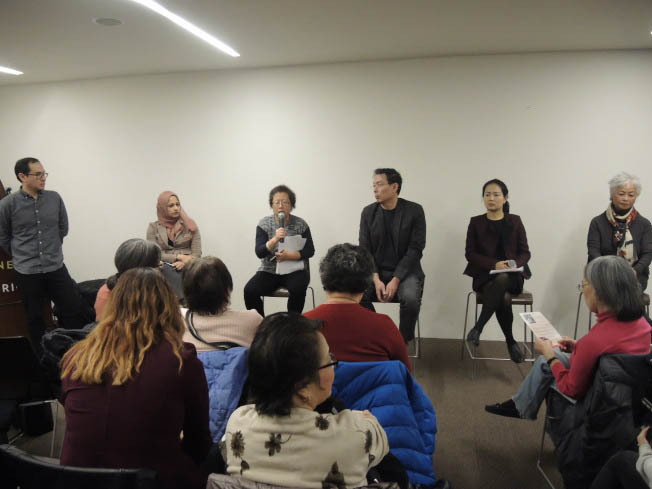 WASHINGTON, D.C. - OCA - Asian Pacific American Advocates denounced the plan to institute a "Muslim registry" and the appeal to the unconstitutional Japanese American incarceration during WWII as a possible grounds for justification of the registry. This Wednesday on Fox News, Carl Higbie spoke out in favor of a "Muslim registry" that would maintain a list of Muslim immigrants in order to track their activities for the purported reason of stopping terrorism. This idea was originally proposed by Kris Kobach, an anti-immigrant lawmaker who claims to be advising President-Elect Trump on his transition team. Higbie, a spokesman for the Make America Great Again PAC and a campaign surrogate for Trump, told host Megyn Kelly in discussing the legality of such a program, "I know the ACLU is going to challenge it, but I think it will pass. We've done it with Iran back a while ago. We did it during World War II with Japanese. Call it what you will, maybe wrong." "The idea of a Muslim registry is inherently discriminatory and antithetical to American values of equality and fair treatment under the law," said Leslie Moe-Kaiser, OCA National President. "This program would not only single out innocent people based on their religion for wrongful prosecution and deportation, but also would be ineffective in stopping terrorism. Carl Higbie's invocation of one of the most shameful episodes of Asian American history as 'precedent' for this registry is a prime example of why we, as Asian Americans and Pacific Islanders, must be ever vigilant in preventing a repeat betrayal of the Constitution. Any effort to rewrite history that revives the grossly misguided 'necessity' of the internment camps is an insult to the memory of the 120,000 Americans of Japanese descent wrongfully incarcerated during WWII. If President-Elect Trump really will be a President for all Americans, then he must disavow Carl Higbie and Kris Kobach. He must also immediately condemn the idea of any kind of registry that singles out residents based on their ethnicity, religion, national origin, or other identity." 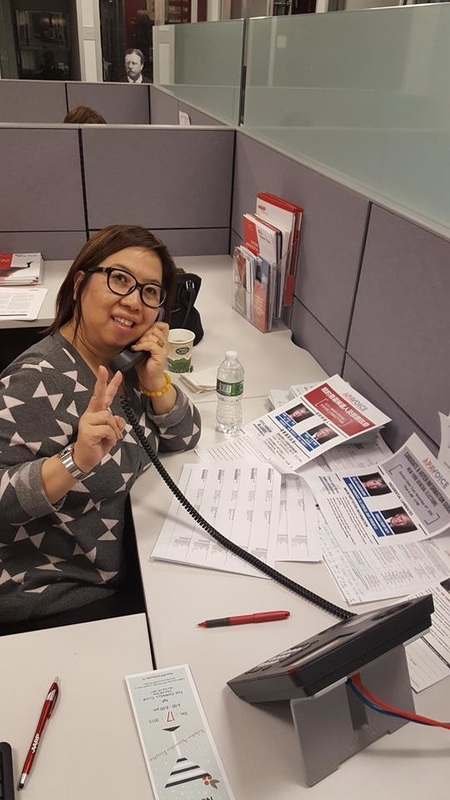 Oca-ny Chapter and AARP volunteers phone banking together to #APAs to get-out-the-vote! Rally TODAY in front of Fox News Channel headquarters protesting the recent “Watters’ World: Chinatown edition” segment on the O’Reilly Factor. 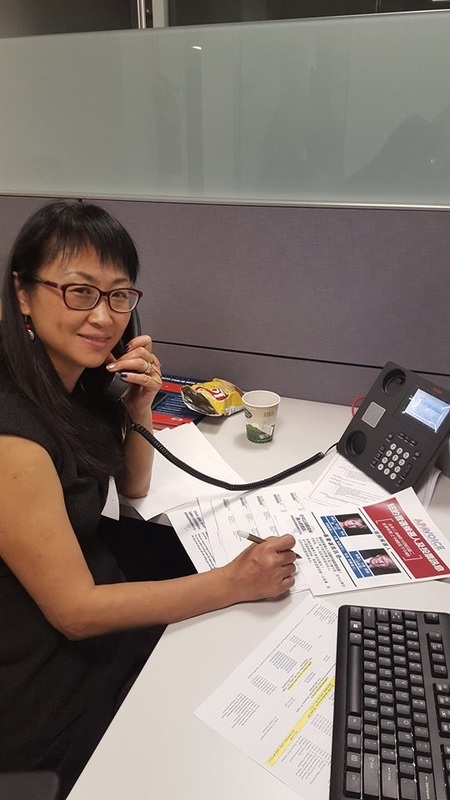 WASHINGTON, D.C. – OCA – Asian Pacific American Advocates is disgusted by a grossly offensive Bill O’Reilly Chinatown segment that aired on the Fox News Network. 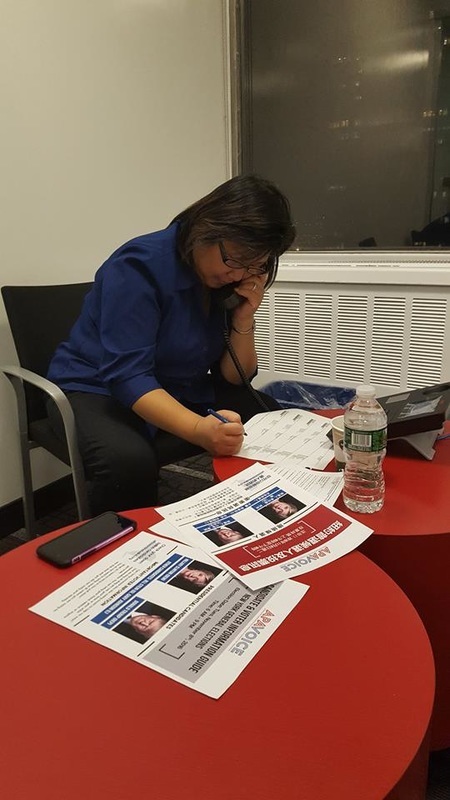 On Tuesday, The Bill O’Reilly Show sent reporter Jesse Watters to “investigate” the effect of criticism of the Chinese government in the current election on Chinese Americans in New York City Chinatown. However, Jesse Watters reporting resulted in demeaning stereotypes of the local Chinatown community rather than investigation of the story at hand. The segment repeatedly mocked community members that could not speak or understand English, conflated Japanese and Chinese cultural institutions, fetishized and sexualized Asian culture, and continuously highlighted stereotypes as wholly representative of the Asian Pacific American community, such as martial arts, massage parlors, accents, and herbal medicine shops. Professor Xiaoxing Xi, a Chinese American physics professor at Temple University, was suddenly arrested at his home in May 2015 and prosecuted by the U.S. government for passing technology secrets to China. The charges against him were dropped because in its rush to judgment, the federal government misconstrued his academic research. Professor Xi is just one example in a long list of Asian American scientists--from Wen Ho Lee to Sherry Chen--who have been falsely charged with espionage. 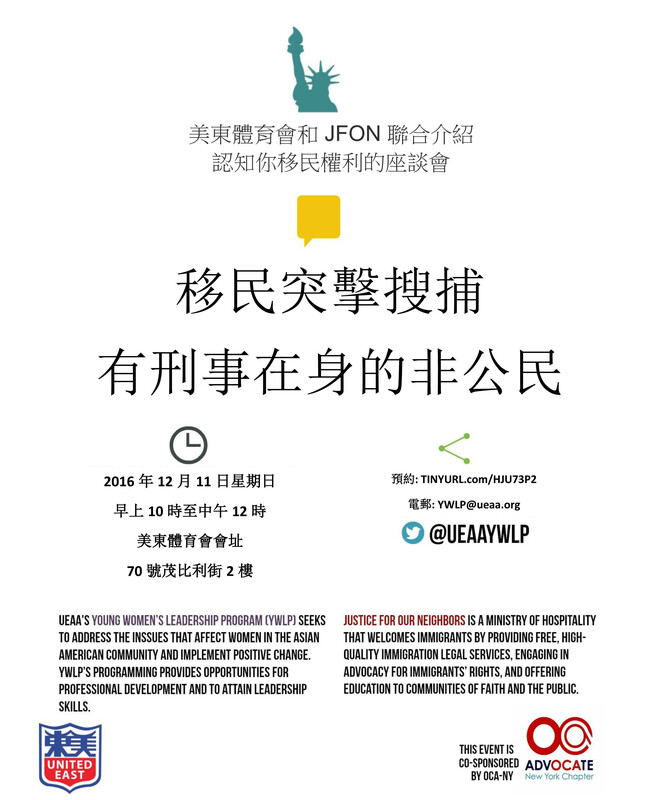 Joyce Xi, daughter of Professor Xi, will speak about her family's ordeal. She is calling for the U.S. government to apologize for its misdeeds and take action to prevent unjust racial profiling of Asian American scientists in the name of national security. On Tuesday, October 4, 5:30 to 7:30 pm, at Roosevelt House (47-49 East 65th Street) in New York City this special event organized by the Asian American Legal Defense and Education Fund and Mapping Asian American New York (MAANY). 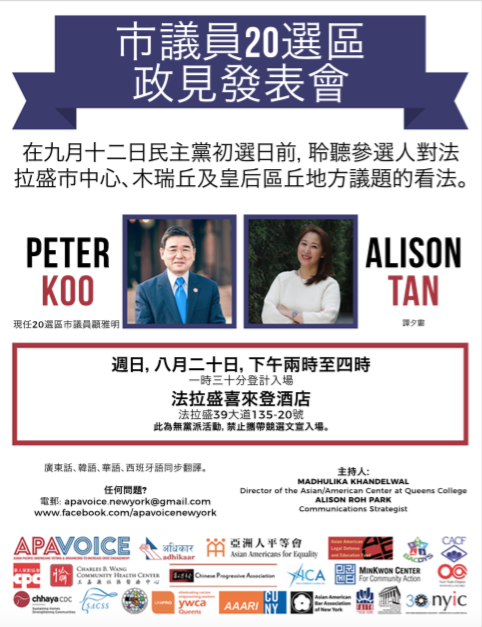 Peter Kwong, Distinguished Professor at Hunter College and co-author of Chinese America: The Untold Story of America's Oldest New Community, will join Margaret Fung, Executive Director of AALDEF in moderating this event. Please RSVP here or call 212-966-5923 before September 30th. Special thanks to Roosevelt House and Dean of Arts and Sciences, Hunter College, and to our co-sponsors (list in formation): Asian American Bar Association of New York (AABANY); Asian American Studies Program, Hunter College; Coalition for the Revitalization of Asian American Studies at Hunter (CRAASH), Columbia University Asian American Alliance, NYU Asian Pacific American Law Students Association. 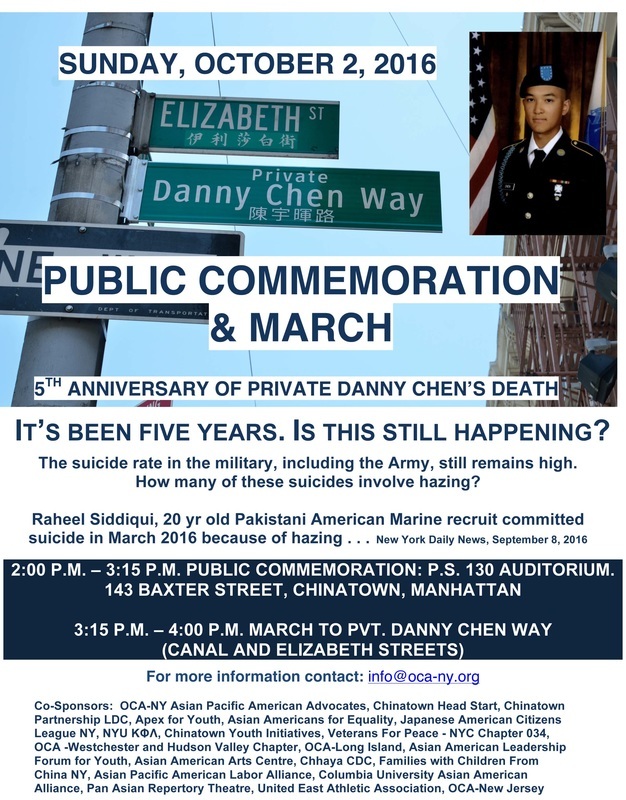 Danny Chen was a 19 year old soldier, found dead in Afghanistan on October 3, 2011, after weeks of unrelenting hazing and racial maltreatment by his supervisors. The public and the military must never forget the sacrifice Pvt. Chen made for our country and the need to ensure all members of the armed forces are treated with "respect and dignity." With the recent suicide of Raheel Siddiqui, a Pakistani American Marine recruit as a result of hazing and religious bigotry and the alarming high rate of suicide still in the military, this reminder is imperative. And, October being anti-bullying month, our events will reach grammar school, high school, and college students, as well as the public nationwide. 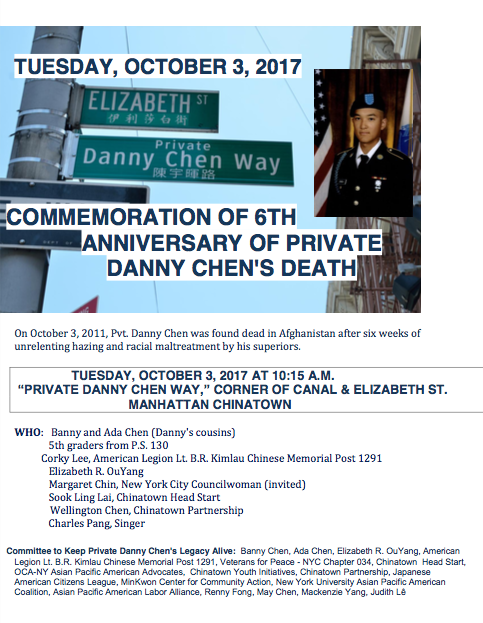 ​For additional activities related to the commemoration of Danny Chen, please download the press advisory file below. Please support the Japanese American Association (JAA) of NY and the New York Buddhist Church by buying tickets to Sadako, the musical from Hawaii that is being performed in NY on Sept 9 (evening) and Sept 10 (mat and evening). It is a story of hope that started a world peace movement in remembrance of the victims of the Hiroshima and Nagasaki bombings. Tickets range from $15 for students of all ages to $30/40 for general admission. VIP tickets including a reception on Friday night are $250. Please call Suki Ports at 212-749-6957 if you have any questions. This is the first trip to NY for many of the cast members so we would like to give them a warm welcome by selling out these performances at John Jay College in Manhattan. OCA-NY is co-sponsoring the Candidates Forum for Senate District 16 on Tuesday, August 23rd. 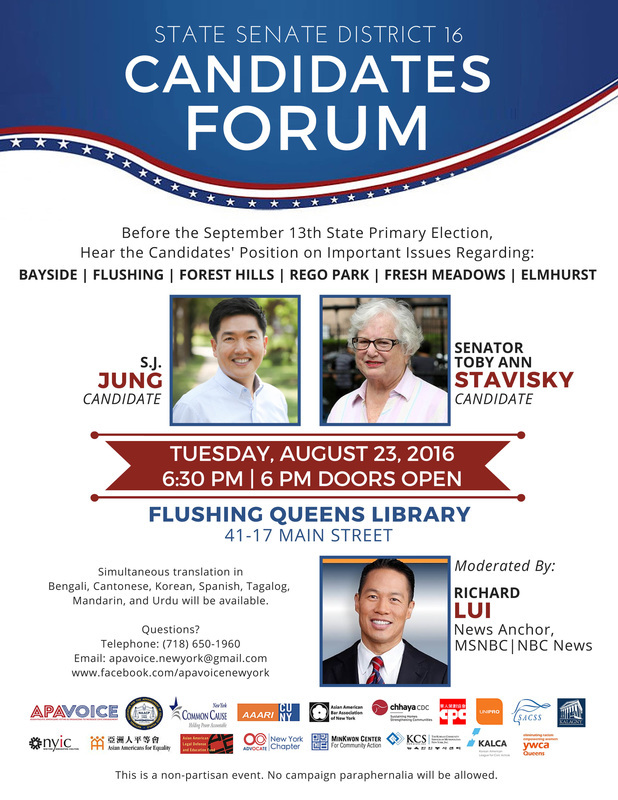 Come hear what these candidates have to say on important issues that impacts Bayside, Flushing, Forest Hills, Rego Park, Fresh Meadows and Elmhurst before the September 13th Primary. Co-sponsored by APA VOICE and Members: Asian Americans for Equality, Asian American Legal Defense and Education Fund, CHHAYA CDC, Chinese American Planning Council-Queens, Korean American League for Civic Action, Korean Community Services, MinKwon Center for Community Action, OCA-NY Asian Pacific American Advocates, Pilipino American Unity for Progress, South Asian Council for Social Services, and YWCA Queens. 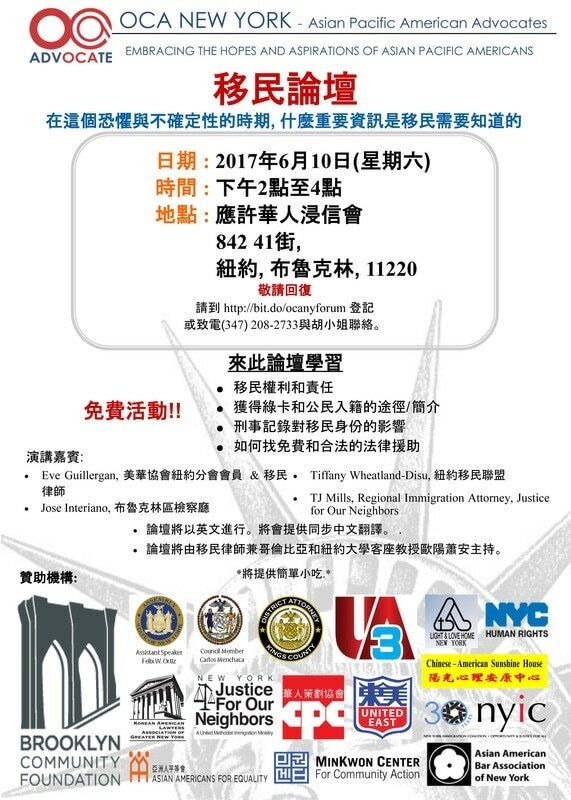 In partnership with Asian American/Asian Research Institute, Asian American Bar Association of New York, Common Cause New York, NAACP Northeast Queens Branch, and The New York Immigration Coalition. 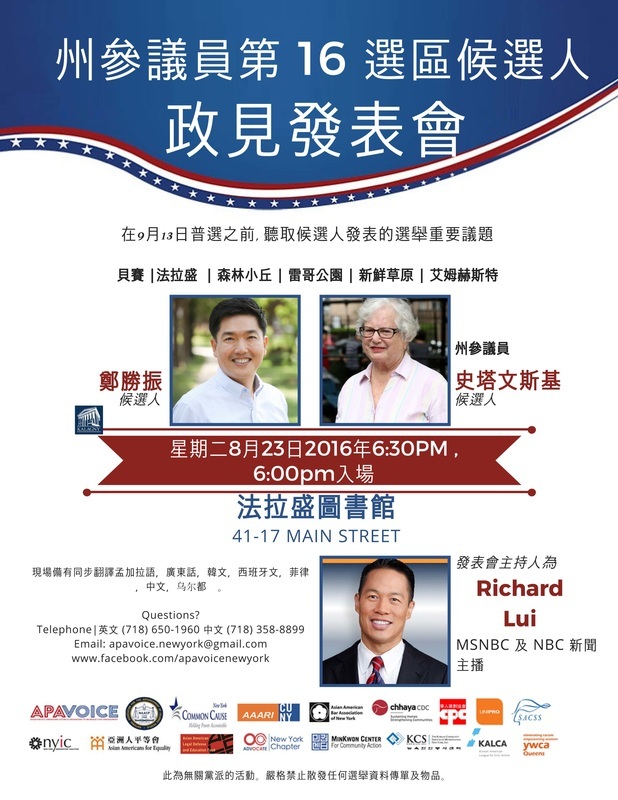 OCA-NY is co-sponsoring the Candidates Forum for Assembly District 65 on Sunday, August 14th. 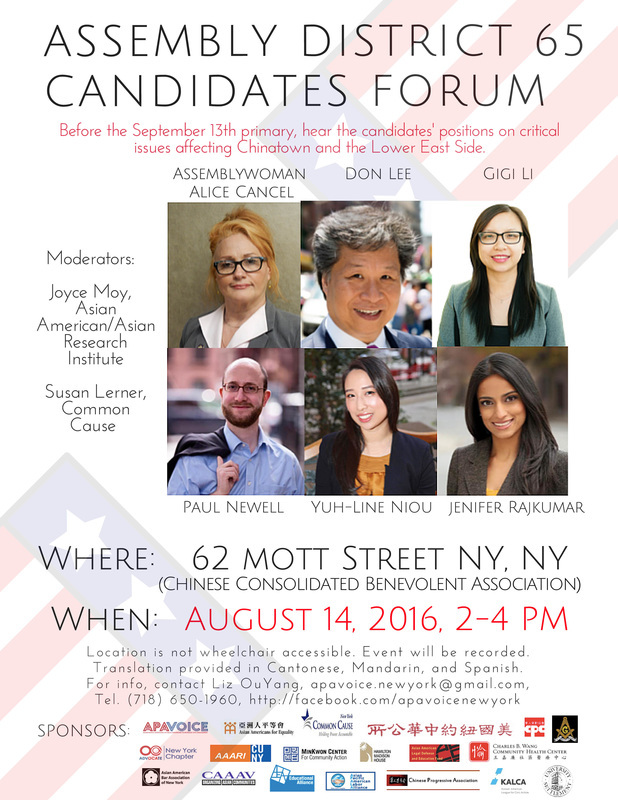 Come hear what these candidates have to say on issues that impacts Chinatown and the Lower East Side. Come prepare with questions that are important to you. We are happy to announce that we are partnering with the Asian American International Film Festival (AAIFF) to promote the following programs! Please take advantage of our 25% Community Partner discount rate for any program at AAIFF (excluding Opening, Centerpiece, and Closing Night). Go to http://aaiff.org/2016/schedule and enter the promo code OCAaaiff16 after you’ve added your desired ticket(s). AAIFF is the first and longest running festival in the country devoted to films by and about Asians and Asian Americans. This year, AAIFF will run from July 21 through July 30, 2016. Please visit http://aaiff.org/2016 for more information. AAIFF’s social media handle is @asiancinevision, and its hashtag this year is #aaiff2016. Arrested at 16 and tried as an adult for kidnapping and robbery, Eddy Zheng served over 20 years in California prisons and jails. Director Ben Wang’s film paints an intimate portrait of Eddy—the prisoner, the immigrant, the son, the activist—on his journey to freedom, rehabilitation and redemption. Discovering that her health problems and two miscarriages were caused by toxic chemicals in nail products, Van Hoang, a Vietnamese immigrant and nail salon owner, becomes one of the first workers in decades to testify against the cosmetic industry before Congress. At 105 years old, Tyrus Wong is a living legend. He is not only the oldest living Chinese American painter, but also the genius illustrator whose design gave birth to Disney’s animated feature Bambi, and whose storyboards inspired the mise-en-scène of numerous Warner Brother’s classics, such as Rebel Without a Cause and Giant. TYRUS unearths the works of an unrecognized genius and his life-long struggle against racism and discrimination in the American film industry. 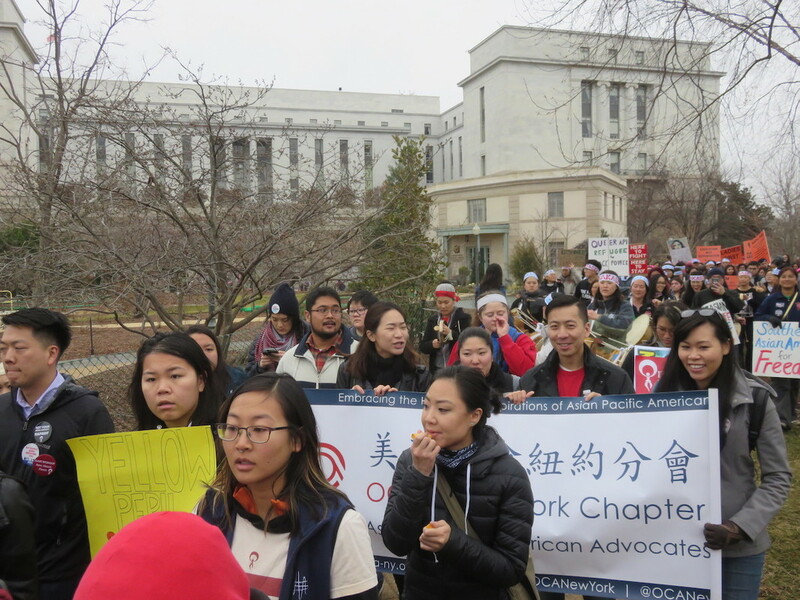 WASHINGTON, D.C. - OCA - Asian Pacific American Advocates is dismayed with the Supreme Court decision on Obama Administration's deferred action programs, DACA and DAPA. Earlier today, the Supreme Court decided in a tie in U.S. v. Texas, resulting in a continuation of the lower court injunction against President Obama's deferred action programs. Both deferred action programs, DACA and DAPA, have been the subjects of several attempts to remove this necessary relief through lawsuits directed at the Obama Administration. After decades of anti-immigrant obstruction to comprehensive immigration reform, four years ago President Obama used his lawful enforcement authority to create the Deferred Action for Childhood Arrivals (DACA) program. This program was supplemented two years later by a further expansion to DACA that would have lifted the age cap on the original program, and the Deferred Action for Parents of Americans and Lawful Permanent Residents (DAPA) program that would have granted protection to the parents of citizens and legal permanent residents. Unfortunately, these attempts have been successful in preventing much needed relief from making its way to the community through both an expanded DACA and DAPA programs. "We are dismayed by this ruling by the Supreme Court," said Leslie Moe-Kaiser, OCA National President. "Of the 11 million undocumented individuals living in the United States, 1.5 million are Asian American. These are our fathers, mothers, sisters, and brothers. When President Obama granted relief to eligible undocumented individuals using his lawful executive enforcement powers, he granted these undocumented members of our community a new lease on life where Congress had failed them so many times. He made it clear that America could no longer tolerate the moral ill of splitting up families and loved ones. The Supreme Court today sullied this vision of a pro-immigrant America by continuing the freeze on DACA and DAPA." "Today's ruling also reinforces the importance of passing comprehensive immigration reform with a path to citizenship. Until the passage of legislation that will ensure that our families can reunite and remain intact in this country, immigrants will continue to be threatened by separation and deportation. Undocumented families in America remain among the most vulnerable members of our society, and anti-immigrant groups will continue to try and disenfranchise and diminish these groups. We cannot allow anti-immigrant forces to redefine what it means to be an American, so OCA will continue to fight for our families, for reunification, and for comprehensive immigration reform," concluded Moe-Kaiser. OCA and other Asian American and Pacific Islander community partners are planning to convene a nationwide call next week to discuss the impact of this decision and a way forward. Be a part of the Hong Kong Dragon Boat Festival in New York. Join OCA-NY Dragons - use the form via the CONTACT tab above. Practice sessions are on Sundays, beginning June 19; 9:15AM -11:30AM. Competition is on August 6 & 7; 9AM - 5PM. Learn the history and the art of Dragon boat racing. Exercise for your mind, body, and soul. Sponsored by Bruce Cost Ginger Ale Unfiltered. Greater New York OCA Chapters believe there are two victims to this tragic incident involving an accidental discharge. An innocent father of a young child is dead. And a career of a young rookie Officer is over. Both Akai Gurley and Officer Peter Liang are victims of multiple failed systems. The NYPD’s ill-advised practice of sending rookie officers to conduct vertical patrols in NYCHA buildings without proper supervision and training put Officer Liang in a compromised situation. If this practice had stopped, Officer Liang and his partner would not have been conducting vertical patrols that night. Furthermore, Akai Gurley would not have been in the darkened stairwell if NYCHA had fixed the elevators. And NYCHA’s failure to fix the lights in the stairwell made the situation even worse. Officer Liang should not bear full responsibility for a less than perfect system. Historically, the criminal justice system has been lenient on officers who have committed even more egregious acts, whose cases have never been brought to trial. This specific case highlights a glaring contradiction in our criminal justice system. Police misconduct and brutality cases can get very disparate outcomes depending on which District Attorney is handling the case, which borough the incident occurred, and the race of the officer and victims involved. In order for the public to have confidence in our judicial system in cases involving police misconduct and brutality, there cannot be these glaring differences. Our judicial system cannot engage in selective prosecution. It must apply the same standards for all. In this case, a rookie police officer, who is an Asian American, is being scapegoated. 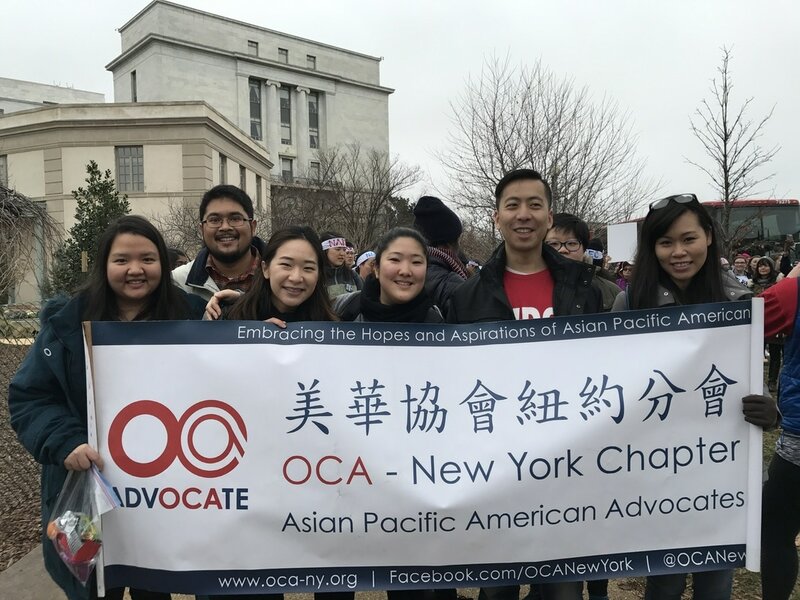 Founded in 1976, OCA-NY is a non-profit civil rights organization that promotes and protects the political, economic, and social rights of Asian Pacific Americans in New York City. ​Come one! Come all! Come and join the Lunar New Year celebration with OCA-NY in Flushing on Saturday, February 13, 2016 and Sunday February 14, 2016 in Manhattan Chinatown. 2016 is the year of the Monkey. The year is 4714 in the Lunar calendar. According to the Chinese Horoscope, Monkey is a smart, naughty, wily and vigilant animal. Were you born in the year of the Monkey? Does your personality reflects like a monkey? Come and share your outlook with our members and friends. Time: 9:30am for some hot coffee and donuts complements of Greater Flushing Chamber of Commerce, and we'll head off to the parade site together at about 10:30AM. WHERE: PS 130 at 143 Baxter Street, NYC. TIME: 11:00 am inside of PS 130 and we will all march outside at 12:30pm lining up on Hester near Mulberry Street. The parade lasts about an hour to an hour and half; dress warmly and in layers. If you have monkey costume, wear it proudly. Budget enough time to get to the meeting place since many streets will be closed for the parade. Afterwards, please join us for lunch. See you all soon!